We’ve been in America for 5 weeks now and only have a few weeks until we’re back in the U.K.!! We started the states on the West Coast and spent a week in both Los Angeles and San Fransisco and these were the top things that we did while we were there! 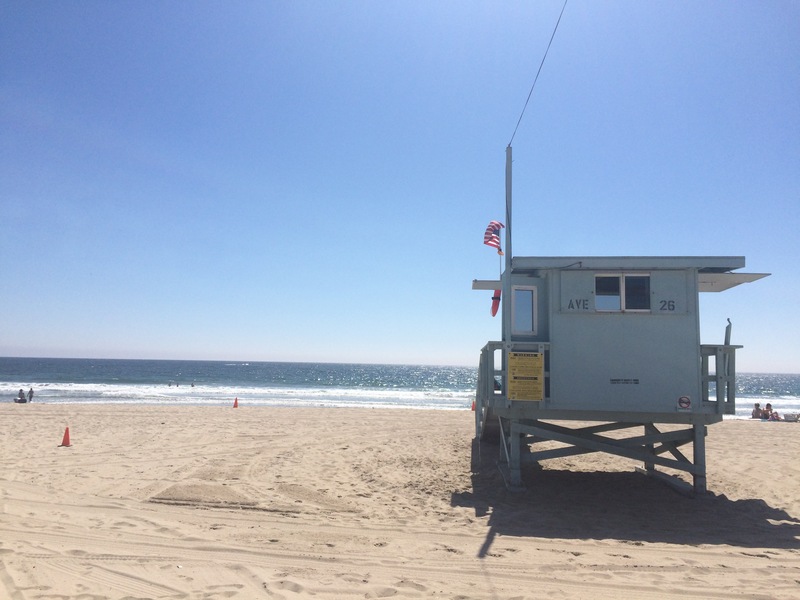 Getting the metro from L.A city to Santa Monica is fairly straight forward and it’s a ten minute walk to the pier. 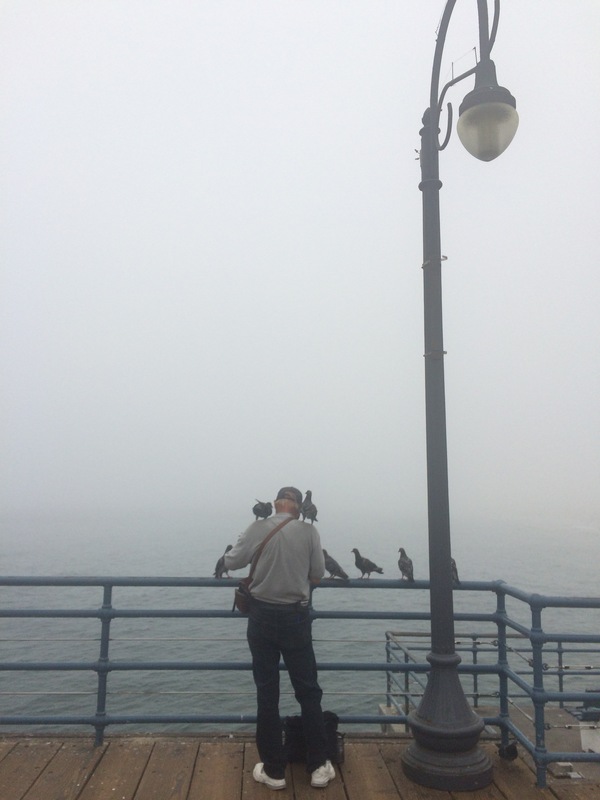 The pier is an all American fair, complete with a Ferris Wheel and a man who was feeding his pigeon friends. When we visited the Pacific fog had rolled in but as we walked down the foreshore towards Venice Beach it cleared and left us with a beautiful view of the sea. Venice itself is good fun, with the fitness fanatics at Muscle Beach, middle of the sidewalk dance-offs and numerous entertainers it’s hard to know where to look but once you get over the initial onslaught it’s a great place to spend the day. We had sandwiches at Zelda’s Corner Deli which we can definitely recommend! We didn’t go to the Observatory at night as recommended but took the 50c shuttle from Vermont/Sunset metro on a busy Sunday afternoon. Griffith Obsv. 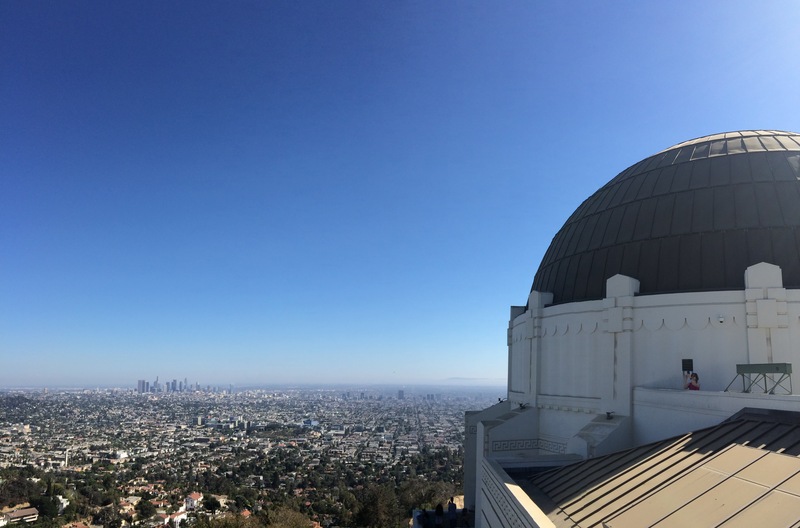 has one of the best views of the Hollywood sign alongside sweeping views over the downtown LA, plus it’s free! 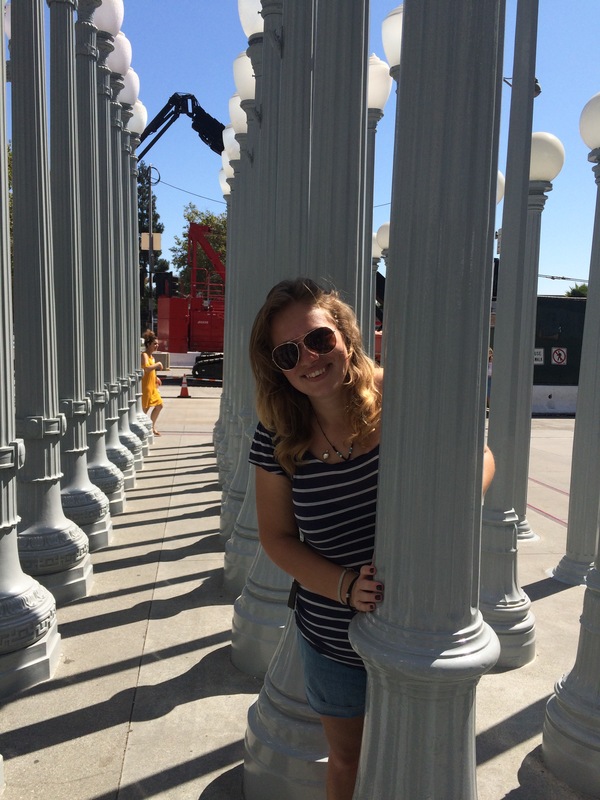 Alright so LACMA isn’t free but it has amazing outdoor installation called Urban Light which is certainly worth visiting. Compiled of gas lamps from all over California the installation is really good to wonder around for while. It’s also just next door to the La Brea Tar Pits which were the literal sticky end for hundreds of ice age animals. We were exceptionally lucky to be given a free walk-in pass to Warner Bros. studios and it was amazing. The studios are essentially enormous aircraft hangers filled with stages on the inside and dressed as neighbourhoods on the outside. As a visitor you aren’t allowed onto the stages we spent a while walking around the deserted streets which have featured in so many blockbusters. The museum was really fantastic and had lots of props from Harry Potter which kept us entertained for a long time. 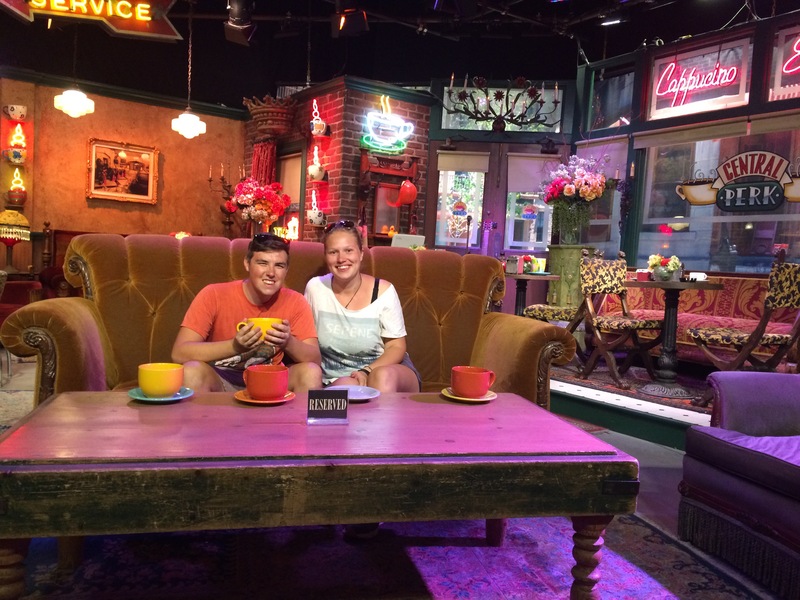 But the ultimate best bit was Stage 48 and the set of Central Perk – Friends heaven! Home of the Walk Of Fame, Grumann’s Chinese Theatre and El Capitan we had a great time wondering around this tiny bit of Hollywood. 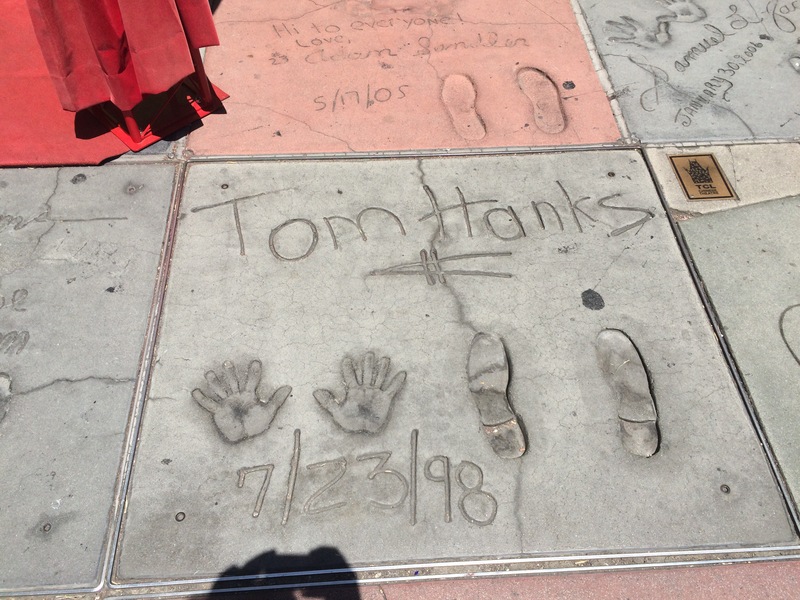 I think I prefer Grumann’s Egyptian Theatre to the Chinese counterpart but I loved finding Tom Hank’s footprints on the floor – turns out I have the same size feet as Forrest Gump! L.A is fairly easy to navigate using public transport, which as a relief because everyone warned us public transport in the US was dismal. The metro system has a weekly pass at $28 and covers most of the city, including most local bus links. Luckily for us we were staying at an Airbnb in North Hollywood, about a ten minute walk from Universal City station! It’s true when they say that American portions are giant because they are, I mean does anyone really need a 40oz refillable soda? No, I don’t think so. But we did find some pretty good food in San Fran including the Clam Chowder which is served in sourdough bowls – yum yum yum! 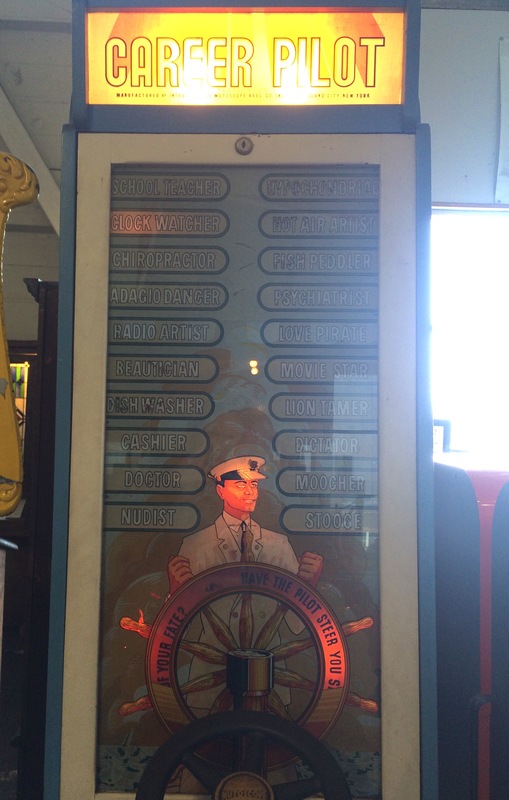 This amazing, little and free museum has hundreds of quarter dollar arcade games which kept us entertained for while. This was my personal favourite – 25c to decide my perfect career, I couldn’t decide between Tyrant, Nudist or Love Pirate. 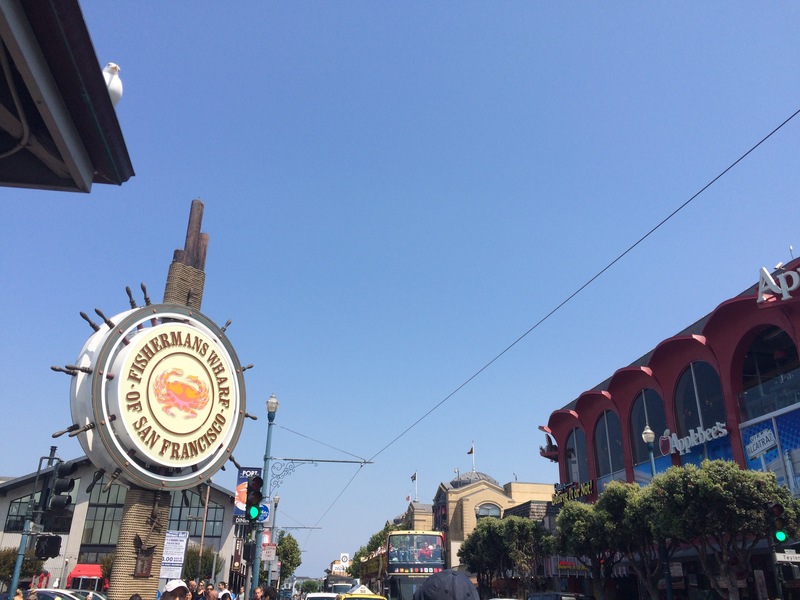 Fisherman’s Wharf is a very pretty, very touristy area of San Fransisco but that’s ok because hey! we’re tourists! I really only liked this area because of the naval ships and because it had a bit of vintage charm. A couple of hundred meters along the sidewalk from FM is Hyde Pier, another wharf equipped with tall ships and a very informative visitor centre. From Fisherman’s Wharf to the bottom of the Golden Gate Bridge is a bit of a walk, but it follows the bay out towards the sea and is pretty enough to make the stroll very pleasant. Unfortunately the weather wasn’t as pleasant when we decided to visit but the fog did break at some points allowing us to see the whole thing and it’s quite spectacular. In truth there are more impressive suspension bridges but I’m glad we visited on its reputation alone. 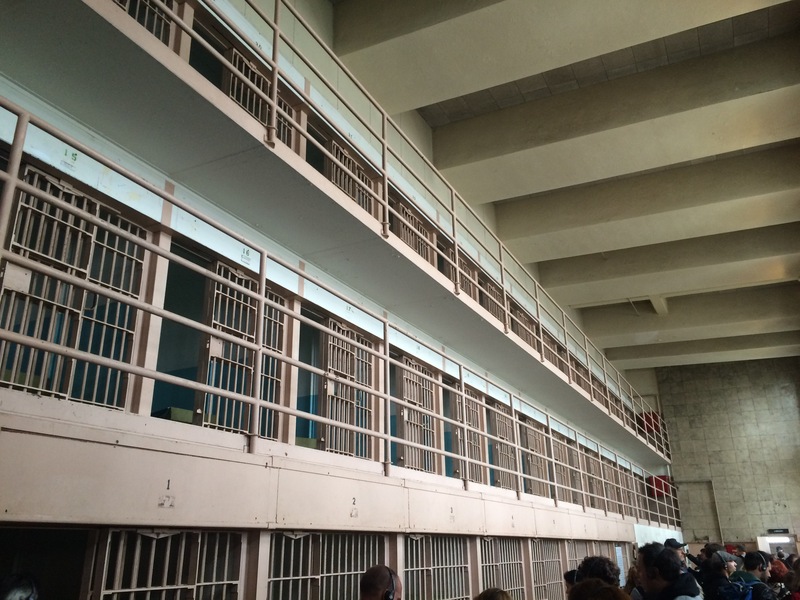 My absolute favourite thing in San Fransisco was our visit to Alcatraz. Occupied in 1853 as a the first US military fort on the West Coast, Alcatraz has had a pretty aggressive history. When we arrived we watched a theatre show about it’s past and then had free reign over where we wondered. The free audio guide around the prison cells detailed the 1962 escape made famous by Clint Eastwood and told us quite a bit about the island’s most infamous inhabitants like Al Capone. We booked the tour way in advance which was a smart move as when we arrived there were no available tours for two weeks – go us! Overall we had a better experience of Los Angeles than San Fransisco. I’m not sure whether it was because SF was more expensive (transport costs were too high) or that we stayed in a rather rough area of Oakland (San Fran’s mainland neighbour) which made our commute a little more interesting or the wind on the bay that catches you off guard if you forget a jacket. We really want to come back to California but hopefully next time we come to San Franscisco we’ll stay in the city centre and bring a few more coats! 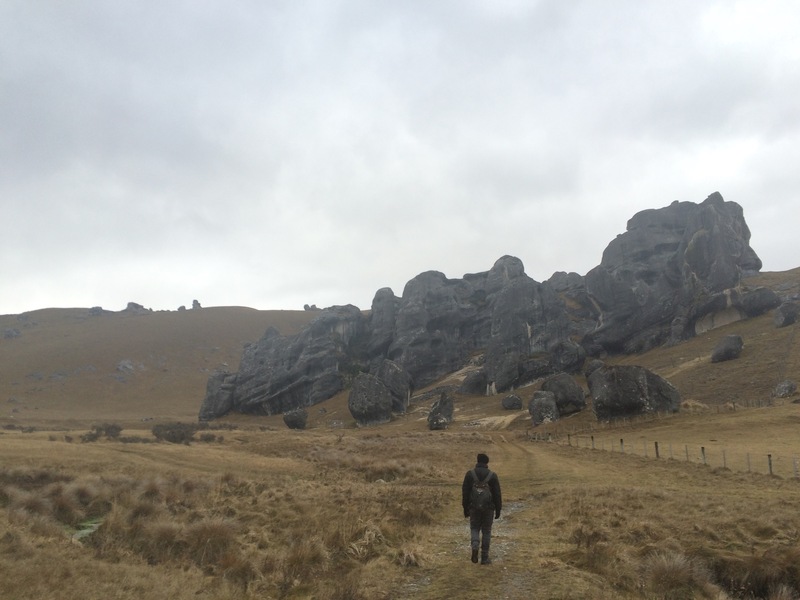 New Zealand: adventures in a cold country. Apologies that our blog posts have been so disjointed for the last few months! We just get a bit carried away with travelling around that all of our time gets eaten up! Plus it turns out that Internet in NZ is tricky to come by and wifi in Fiji is more or less non existent so it’s been almost impossible to load anything. 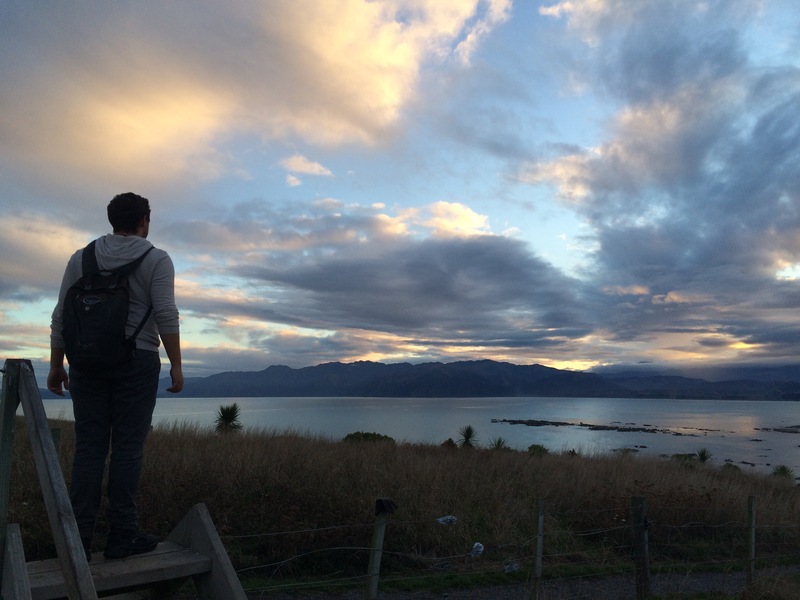 So here’s a quick recap of what we got up to in New Zealand. We arrived, which is always a good start, and what do you know it was raining! 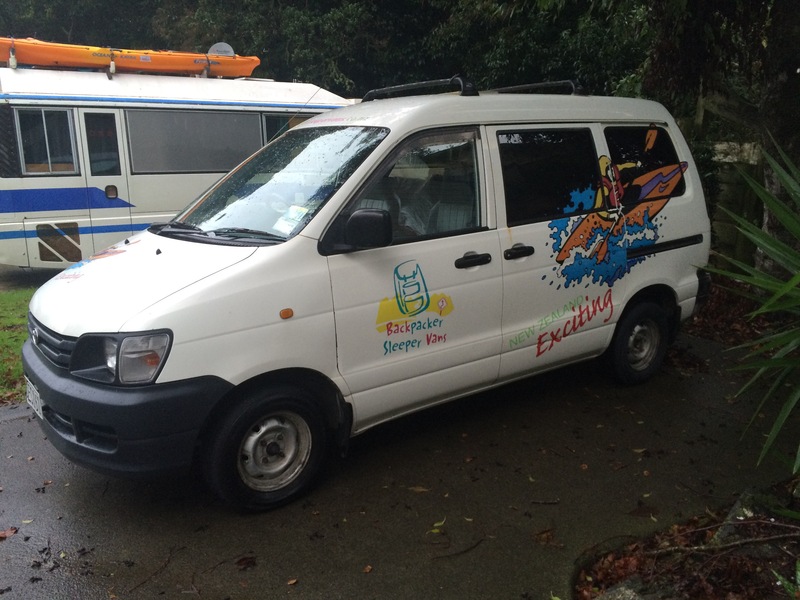 I think around Auckland in the winter it rains most days but it was ok because we were staying in another watertight campervan. The van was older than both of us, covered in rust but it did have power steering – definitely a bonus. The bed area was also so small that we couldn’t lie down shoulder to shoulder, however when the temperature dropped below -9°c we were happy to be in an endless cuddle to keep the cold out! The townace that we named ‘Skip’. New Zealand in winter is just like the UK but it’s more beautiful. It’s a little like the Scottish Highlands spread over two islands and without the castles, but including all of the cold. The north is warmer than the south but is a little less dramatic scenery wise. Generally we preferred the South but it was a relief, in the North, to be able to wake up in the morning and look outside rather than having to de-ice the insides of the windows first. Not sure if this is Tolkien’s Shire or Derby-shire? We spent a week on the North Island at the start of the trip, trundling down endlessly winding roads towards Wellington. 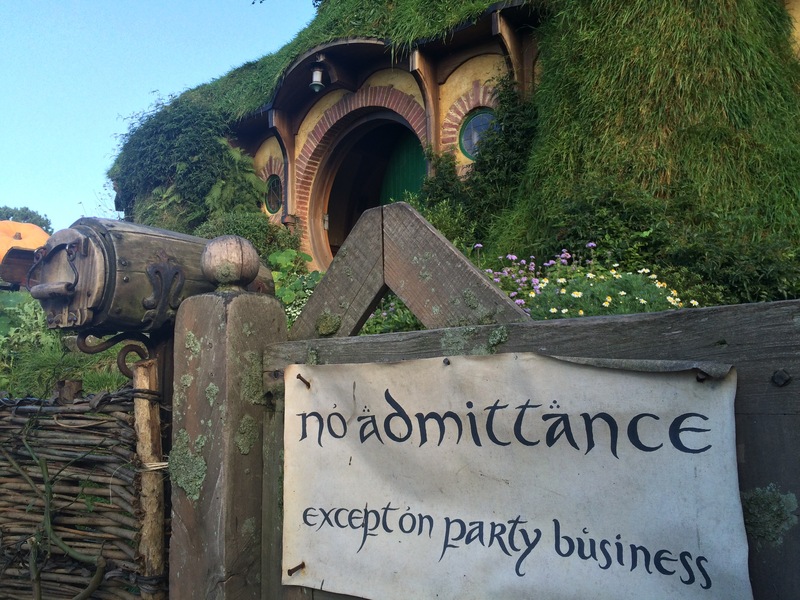 The best thing about North Island is Lord of the Rings. 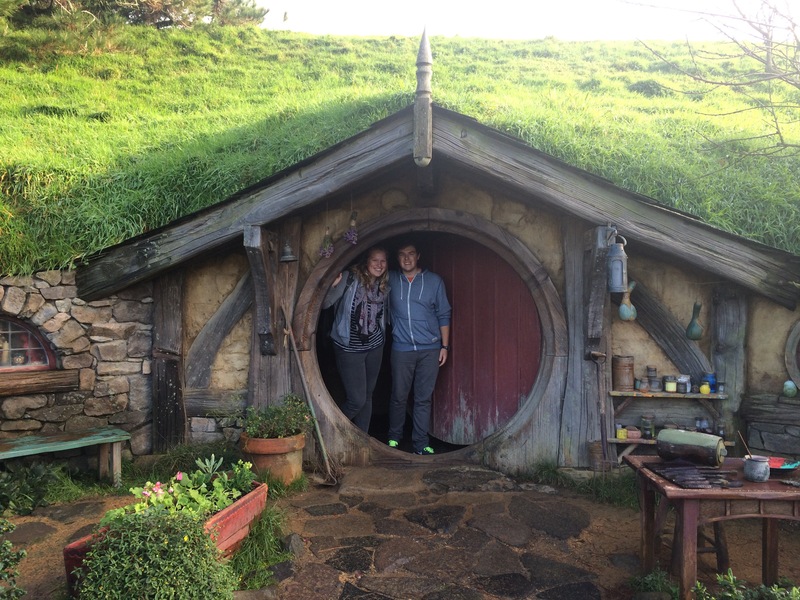 Lord of the Rings was a major feature in my childhood, Chris and I must of been 9 and 7 years old when the first film came out and it shaped a lot of our stories, so coming to NZ as an adult to the actual sets was incredible. 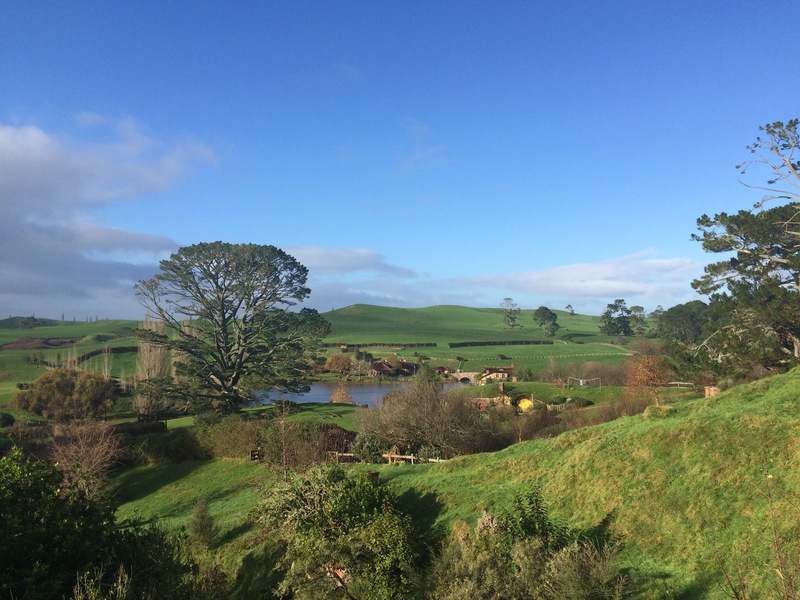 Hobbiton, just outside Mata Mata was our first port of call and it was amazing! The amount of detail that went into creating the set is phenomenal. For example, the tree that stands above Bag End (Bilbo’s House) has thousands of hand painted leaves on it. When filming for The Hobbit was delayed the leaves slightly changed colour so Peter Jackson hired someone to spray paint each individual leaf back to the right tone. It’s only in the background for a few seconds in each movie. 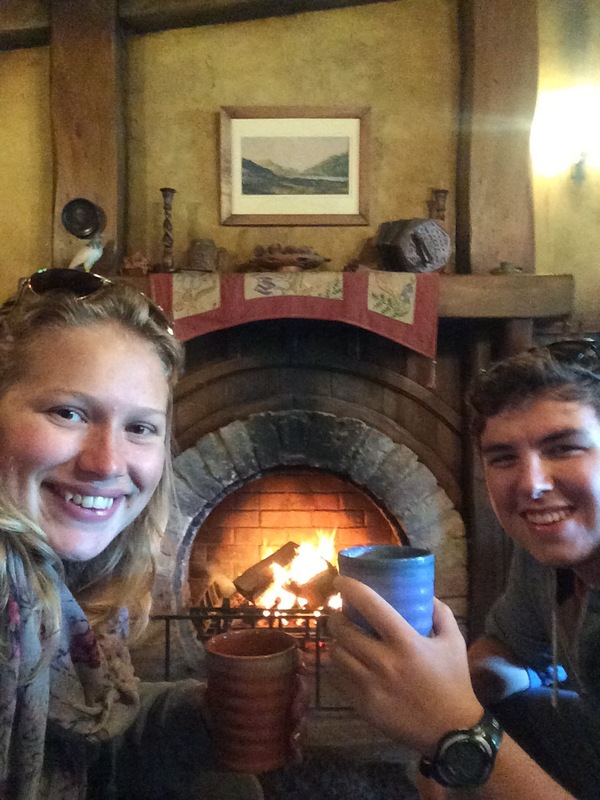 The tour lasts a few hours and at the end you get to have a cider at The Green Dragon Inn and pretend you’re a hobbit for a little bit longer. After Hobbiton we headed south, through the Tongariro National Park which surrounds the mountain that features as Mount Doom and finally after a few days found ourselves in the comforts of the “last homely house”, or Rivendell for anyone who hasn’t read the book. 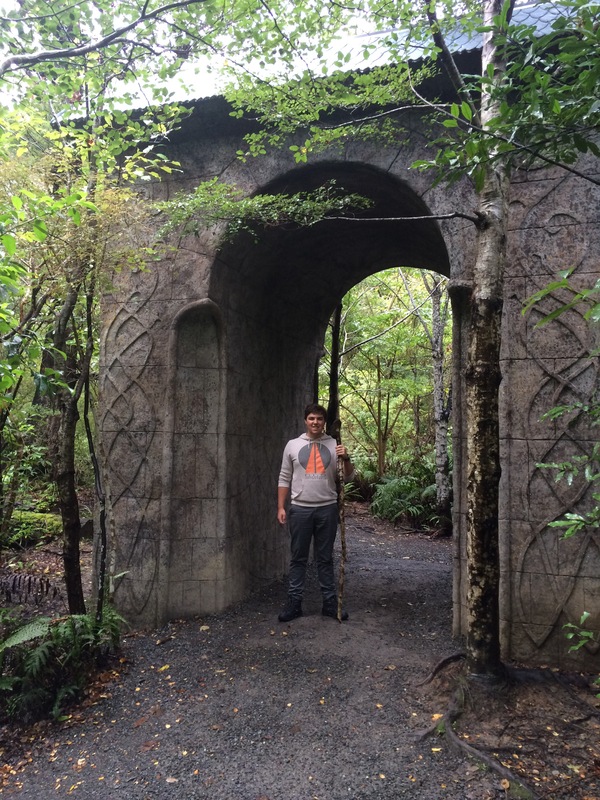 There’s actually nothing left of the Rivendell set apart from pretty convincing archway provided by the council. There are some good walks around though and a campsite where we stayed before catching the ferry to South Island. South Island has lots of staggeringly beautiful vistas but it’s also home to lots of amazing animals. 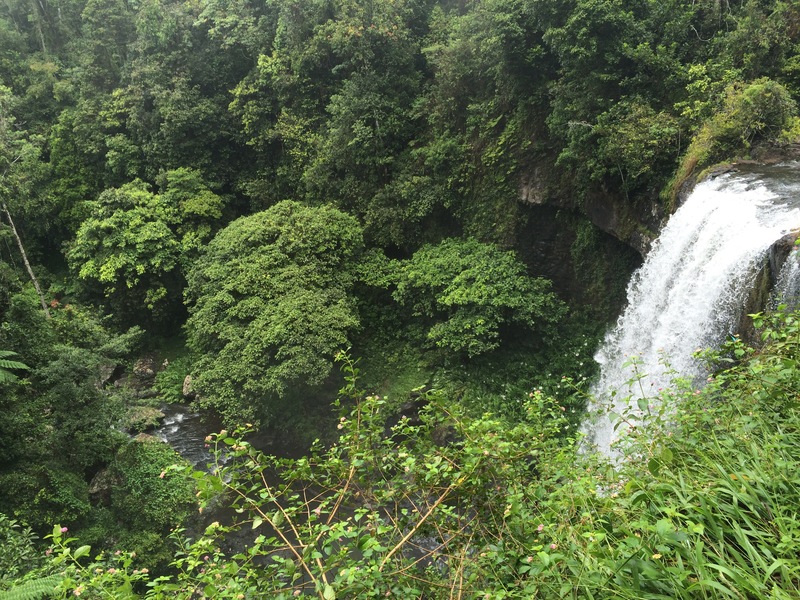 One of the best wildlife spots was Oahu Waterfall just outside Kiakoura on the East Coast. 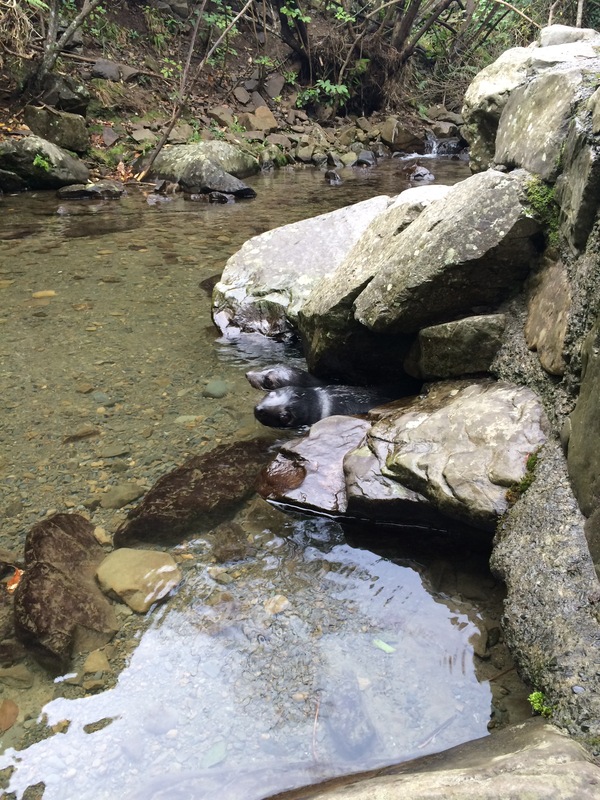 It’s a seal nursery and we were pretty thrilled when we saw these two hiding out at the bottom of the stream. 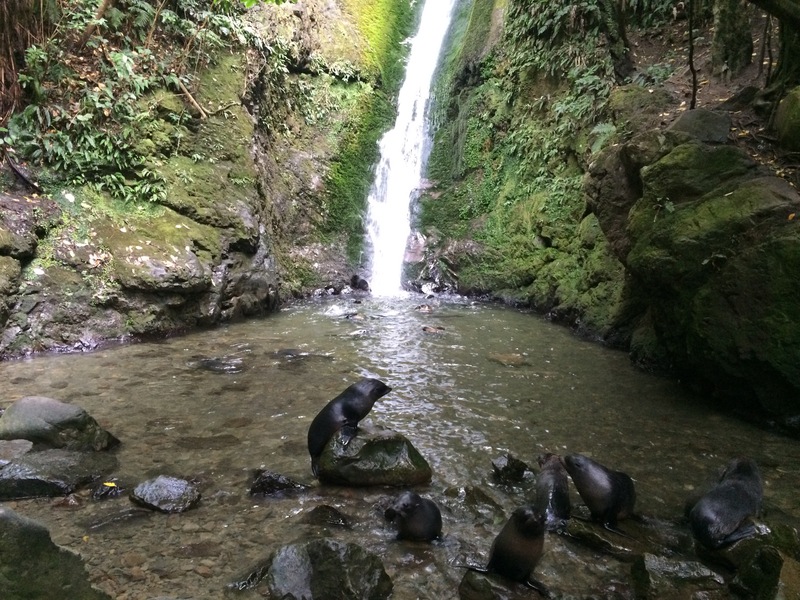 But when we got to the waterfall and saw so many baby seals playing in the pool we were blown away! 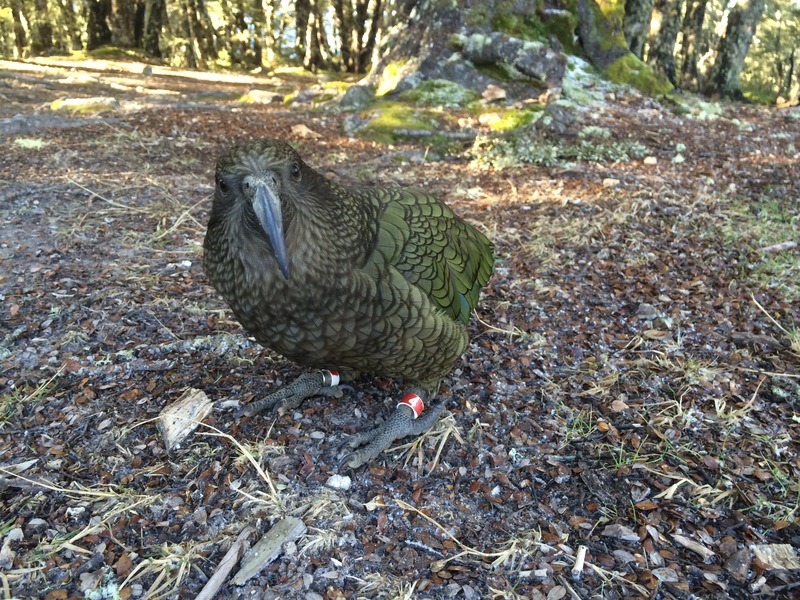 The other main animal encounter that we had was with Keas on Arthur’s Pass. They’re nifty menaces, stealing food and rubber from people’s cars but they’re also really clever. 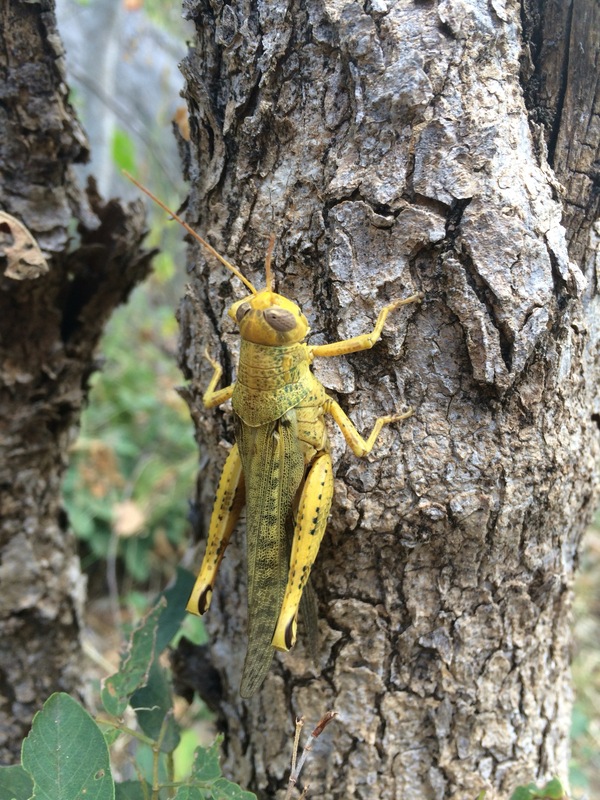 We met this one on the Bealey Spur Track and it showed us that it can open the zipper of backpacks. Arthur’s Pass is truly phenomenal and I urge anyone with a love of mountains to visit one day. Castle Hill, Bealey Spur and the Devil’s Punchbowl were our highlights but there are so many more that we would love to go back and explore, we just might take decent walking boots rather than £17 ones from a discount shoe shop. 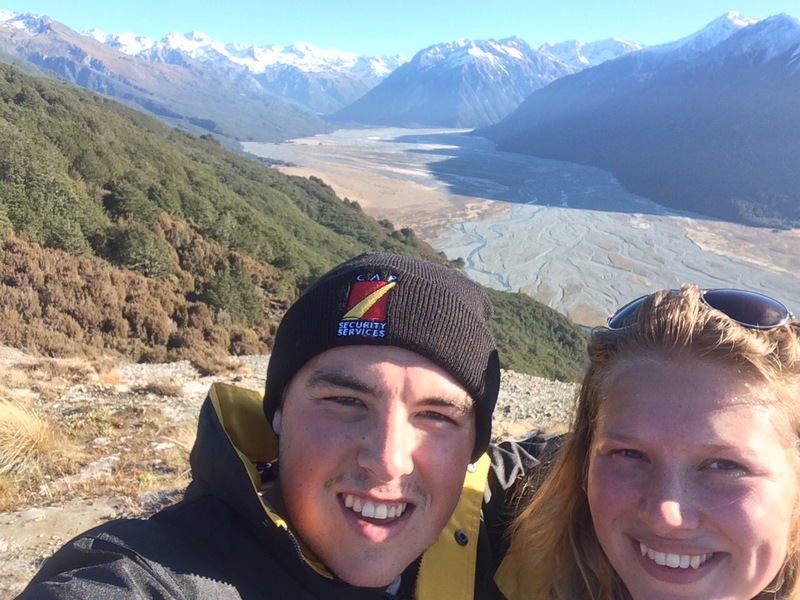 Arthur’s Pass is the start of the Southern Alps which are home to the Franz Josef and Fox Glaciers alongside Lake Matheson (the mirror lake); Queenstown and the Remarkables; Lake Wanaka with its famous tree and Lakes Tekapo and Pukaki to the East. 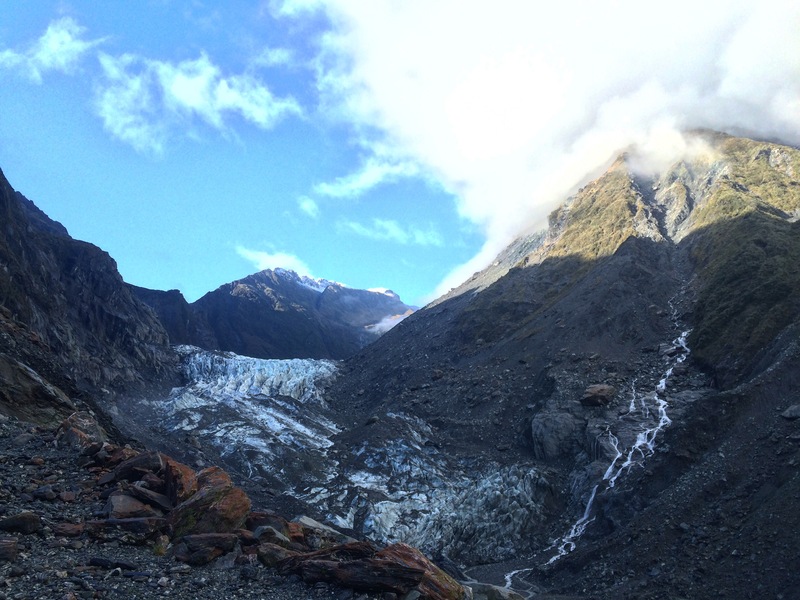 Fox and Franz Josef were the first glaciers we’ve ever seen and they were dirtier than we expected. They’re also retreating at an alarming rate so I’m glad we’ve seen them before they disappear. 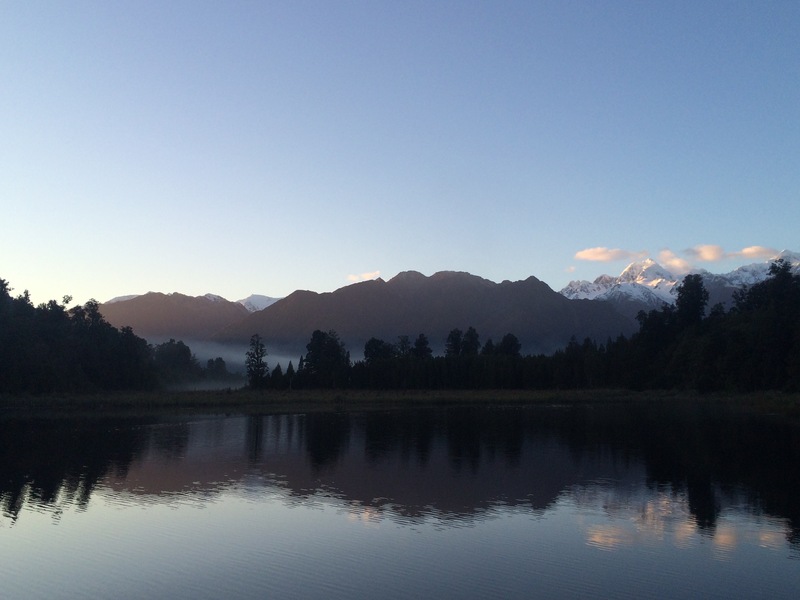 Nearby Lake Matheson, which was formed by a retreating glacier, is known as the mirror lake which reflects Mt Cook on a clear day. Unfortunately it wasn’t windless when we were there but we slept in the car park and woke up to a breathtaking sunrise. 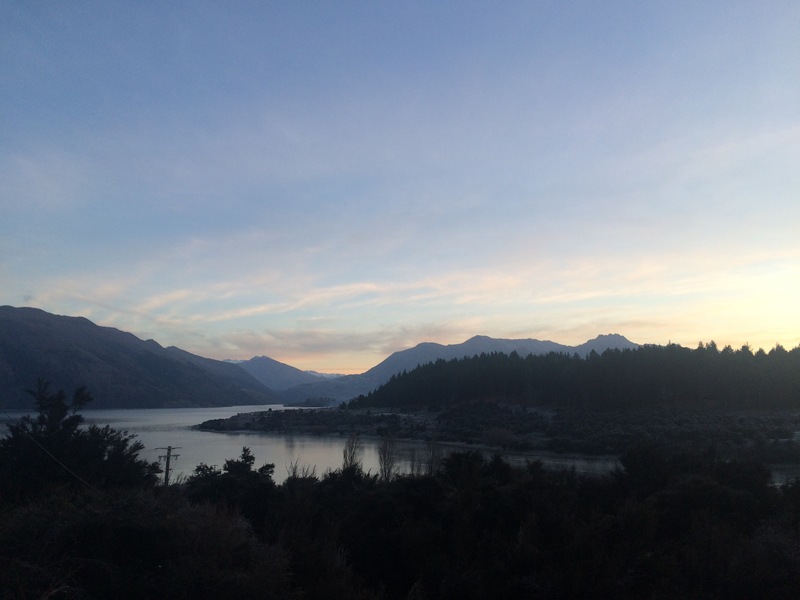 Just south of Lake Matheson, Lake Wanaka is renowned for its beauty and we stayed at a campsite (with a hot shower!!!) on the shore. This was the view that we woke up to on my birthday and in all of the time we’ve been away (except maybe New Year!) I’ve never felt so lucky. 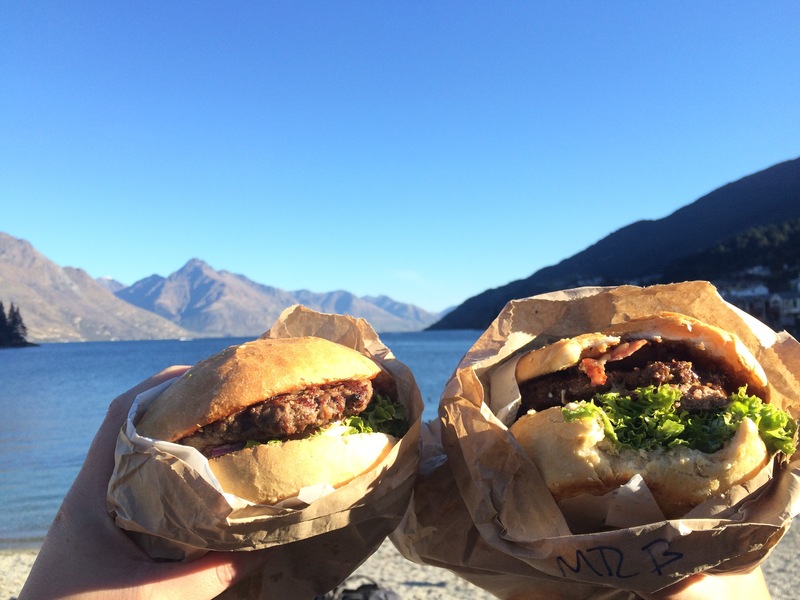 Also on my birthday we visited Queenstown and had Ferg Burgers. For those of you who don’t know who Ferg is or what’s so great about his burgers I’ll tell you. They’re simply the best burgers in all of New Zealand and they’re so popular that the queue goes to the end of the street. Luckily for us we got there during a lull, ordered ours fairly quickly and ate them looking over the pier. After Queenstown we continued our journey south and got closer to the Antarctic than ever before, and possibly ever again. 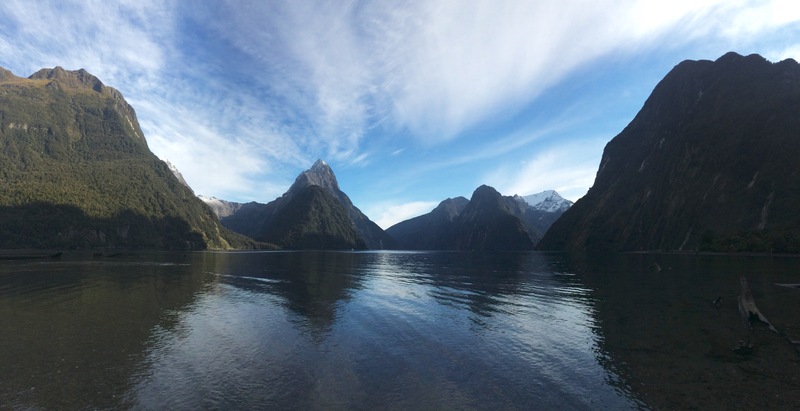 We headed to Milford Sound and the Fjordlands which are breathtaking. And then we began on the long track back to the North. 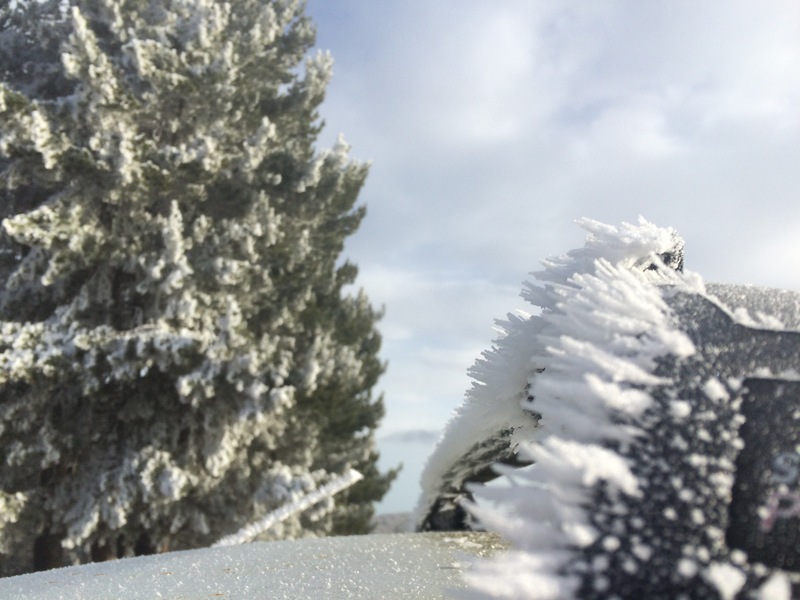 We stopped at Lake Pukaki where the frost on the trees was an inch thick and we had our coldest night next to the bright blue lake. 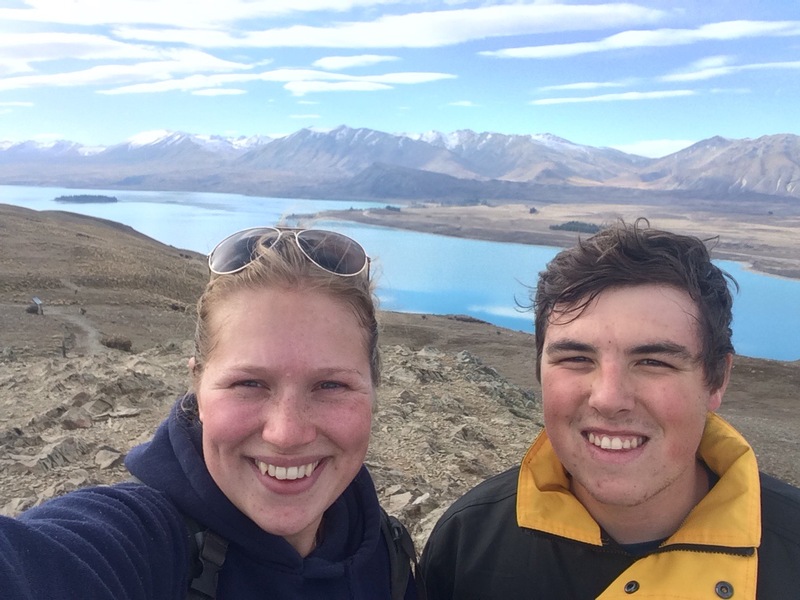 We hiked up Mt John Summit and looked over the equally blue Lake Tekapo. And made our way back to Picton, hopped on the ferry and enjoyed a 4 metre swell all the way back to North Island. 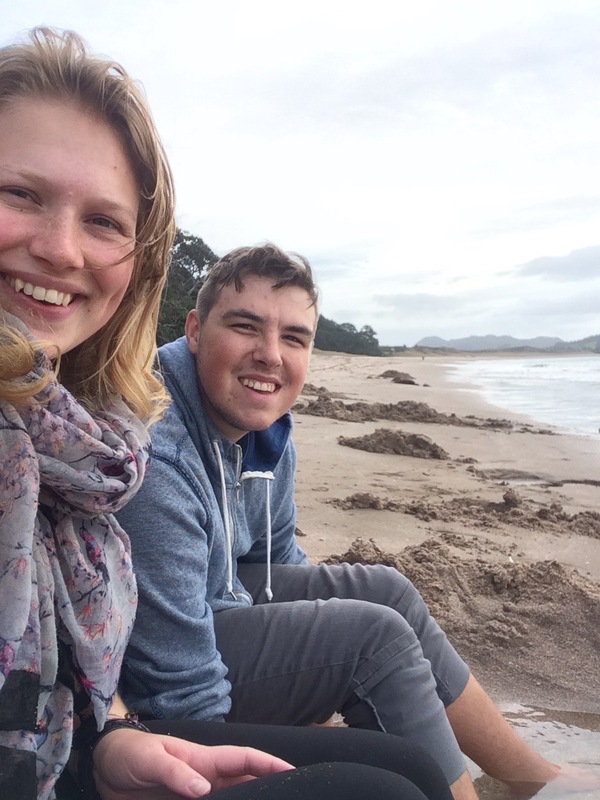 Our final adventure in North Island was on the Coromandel Peninsula at Cathedral Cove and Hot Water Beach. There were a lot of times in NZ when I wished we’d of visited in the summer months so we wouldn’t have to freeze anymore but on the Peninsula I was glad we were there off season. 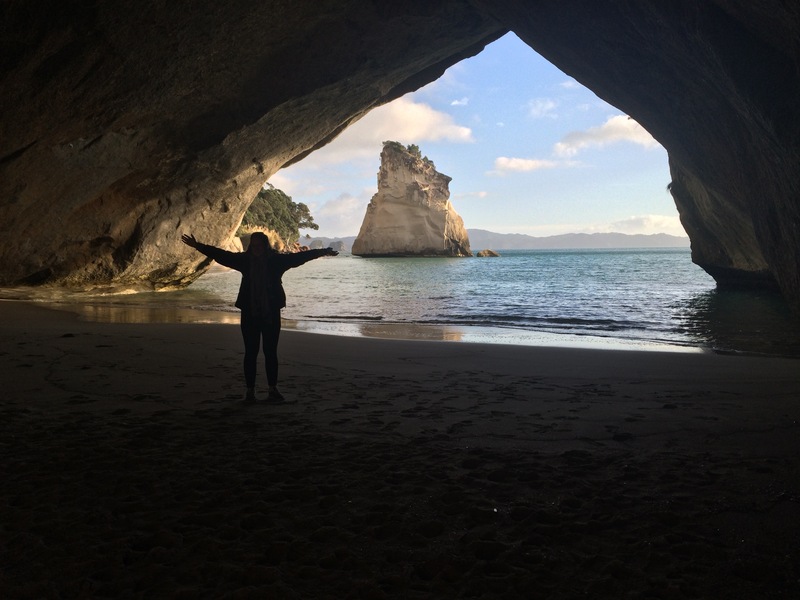 Cathedral Cove was used as a set in The Chronicles of Narnia: Prince Caspian. So obviously I desperately wanted to go and I’m glad we did because it’s very pretty. It was also deserted when we were there and we had the whole beach to ourselves. Similarly Hot Water beach was quite when we arrived apart from two other couples standing with their toes in the hot sand. There are lots of geothermal hotspots all over New Zealand and at Hot Water Beach a hot fresh water spring comes up through the sand to meet the cold Pacific Ocean. So all we had to do was find a hot spot and start digging! Built ourselves a nice little foot spa! Farewell New Zealand and thanks for the memories even if they weren’t that warm. It’s a long way to come but I hope that we’ll be back again one day. 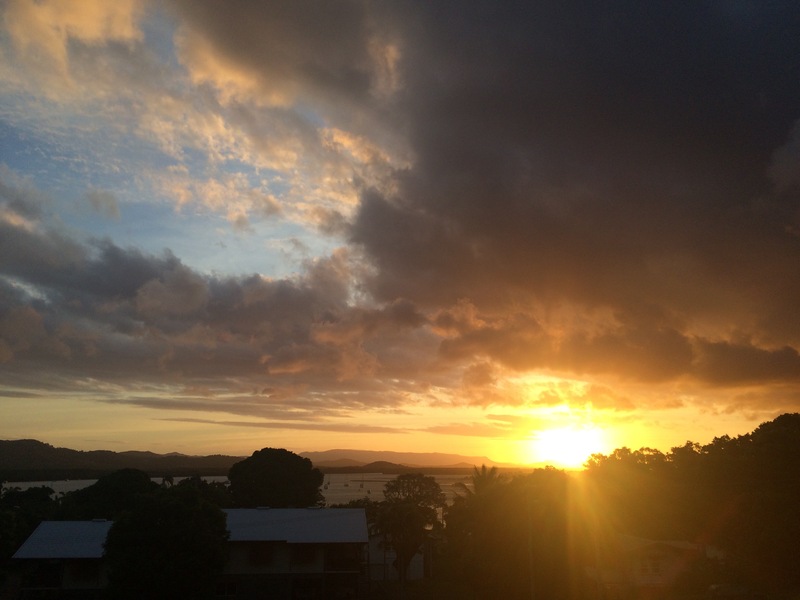 ﻿Far North Queensland: into the tropics. I know it’s stereotypically British to talk about the weather but that’s the first thing that needs to be mentioned in a blogpost about the tropics. We don’t mind the rain in the UK, I know we complain about it a lot but it’s really very good rain in comparison to the downpours you get in the far North Queensland. I mean hot rain, who wants it?!? You get soaked, then it’s so humid that nothing dries and everything stays damp. On top of that you can’t open any windows because it’s pouring outside and it’s stifling. 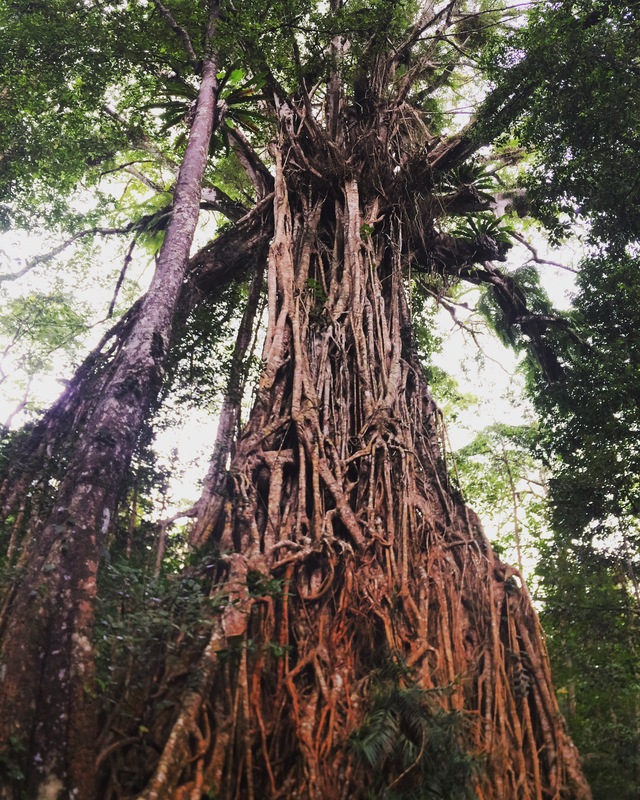 BUT… what should you expect in the rainforest? Nice dry days with just a hint of drizzle? No, you expect the wet and it delivers. The benefit is that it makes everything so green and so extraordinary. 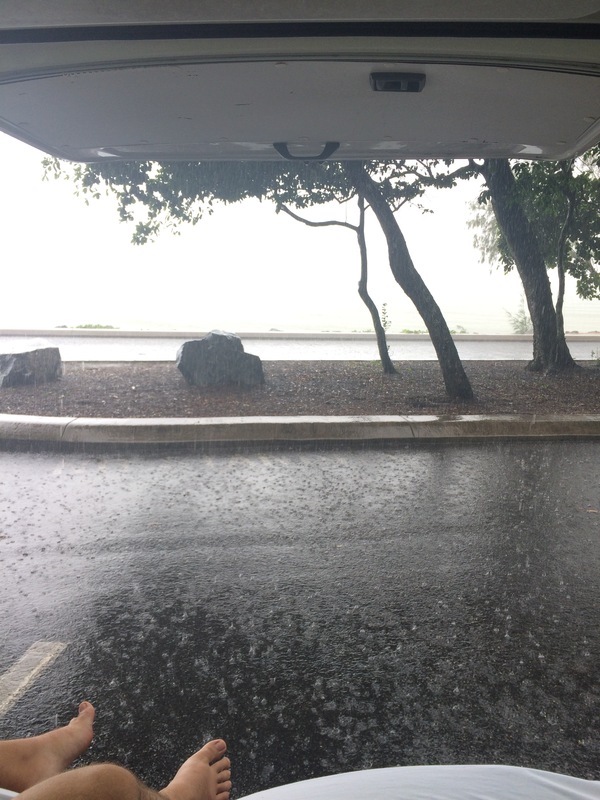 We did think that the dry season was on its way when we were in Mareeba with nice days and cooler nights but as we journeyed north to Cook Town to visit Anne and Jim’s son Adam and his family, we caught up with the wet and took the rain along with us. Adam and Jackie kindly put us up for the ANZAC weekend so we had three days of exploring. Cook Town is remote, windy and wonderful. 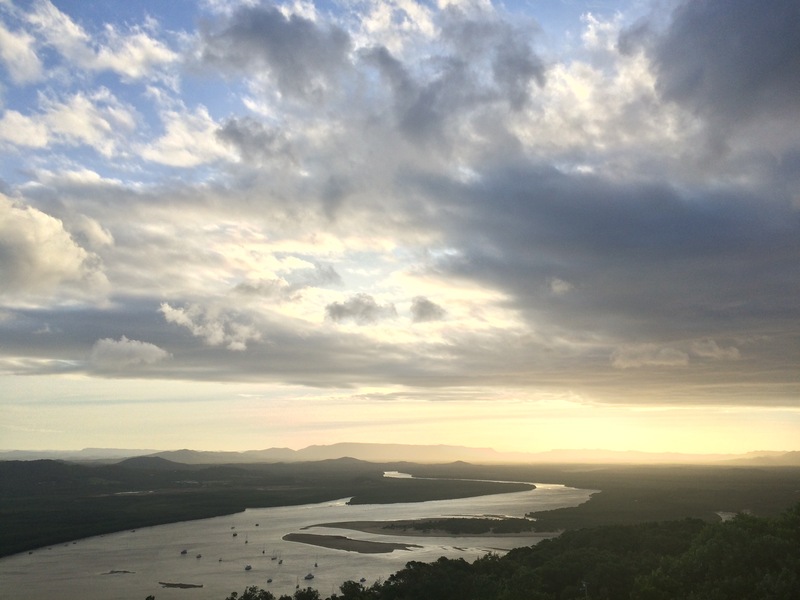 On the day we arrived, we (led by Adam’s three year old son Sean) walked to two of CT’s beaches and up to Grassy Hill which looks out over the Endeavour River and walked down the other side to a glorious sunset. The town might not have a large population, a major supermarket or first class 3G signal but the sunsets are amazing. 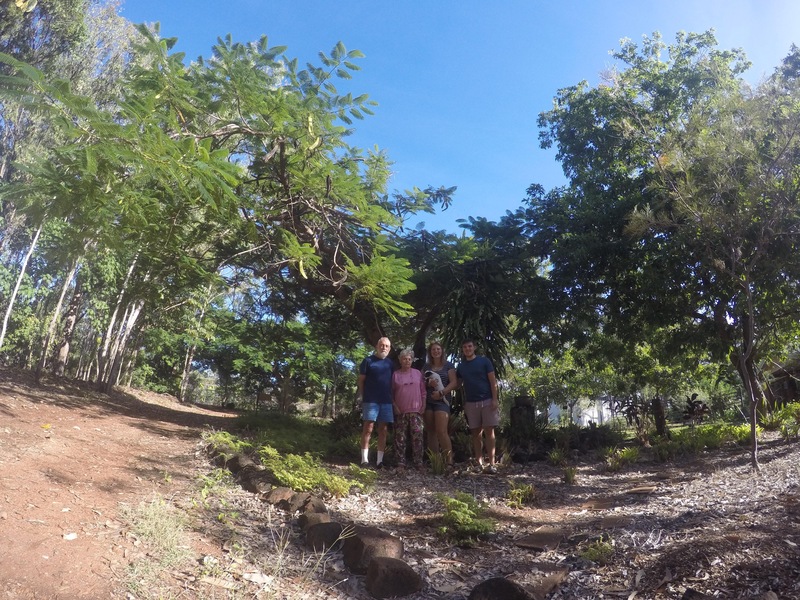 So to Adam, Jackie, Tara and Sean – thank you for taking us to your hidden camping and swimming spot; for driving us to the giant waterfall (that we would never have ventured to in our 2wd van!) and for taking us to an authentic Australian pub. Also for the first lasagne we’d had since leaving home and so many more tasty things; for playing rocket league and for showing us around Cook Town and sharing your home with us, it was so good to meet up with you and hopefully we’ll see you all again soon. After Cook Town and a little detour to Cape Tribulation we headed south along Queensland’s coast to Townsville. Townsville is the biggest city in Northern Queensland, bigger than Cairns in fact although it’s not as well known. And generally we preferred Townsville, it was just a bit less humid and has some very pretty areas. While we were in Townsville we ventured to the top of Castle Hill and looked over the city towards Magnetic Island which was stunning. We also visited the strand and the city centre (which had free wifi!) and found ourselves a new favourite ice cream parlour to boot. Just as a side note (if anyone comes out to Australia) free wifi can be found in any major city centre, large shopping mall or leisure facility. Cities and large towns also often have free swimming pools and showers, Townsville has two free swimming pools, one has a 75 metre lane and an infinity pool where you look over into the river where lots of fresh water turtles live. No wonder Australia has the second best quality of life in the world eh? I wish my tax went towards free wifi and swimming pools! 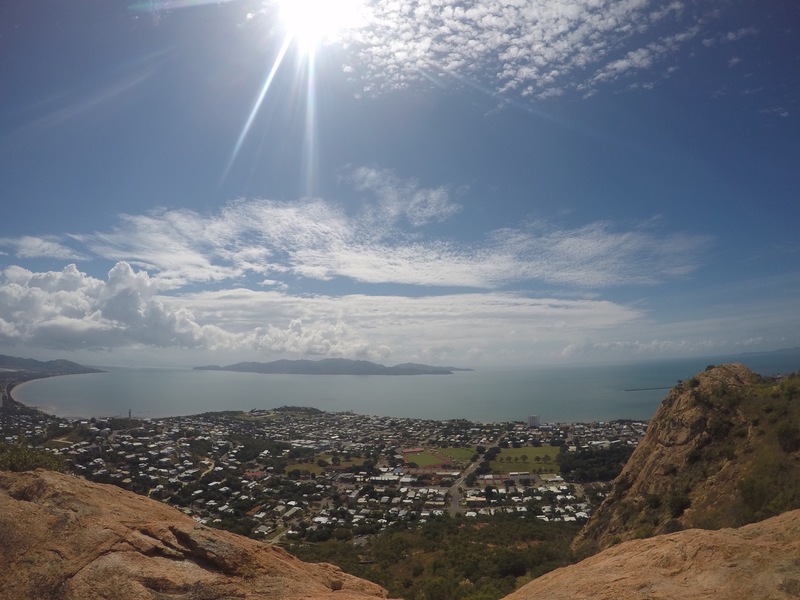 We stayed around Townsville for about a week, visiting the city centre as well as little creeks and swimming holes in the surrounding hills and then we headed off to Magnetic Island. 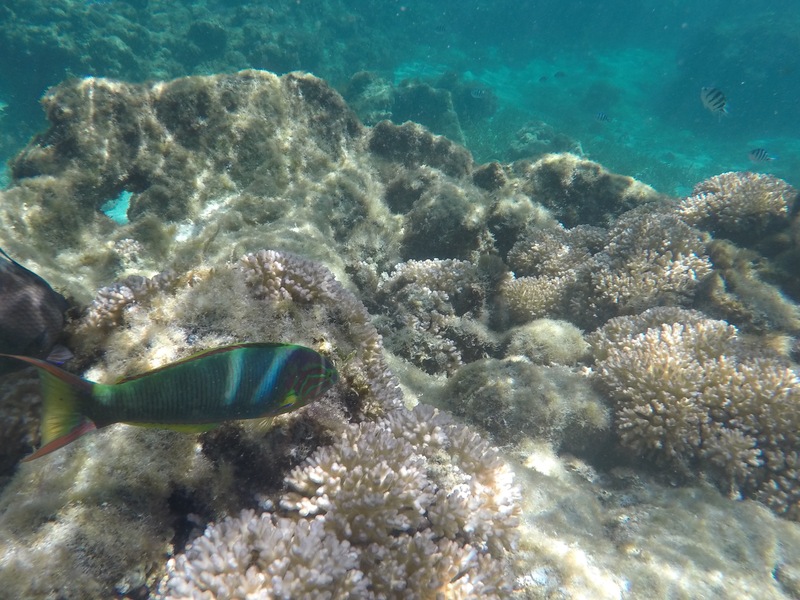 We went to Magnetic Island hunting the reef. Florence and Arthur Bay, on the north side of the island, are part of the Great Barrier Reef Marine National Park but unfortunately when we arrived (probably because of the rain that keeps following us) the visibility was quite poor and a lot of the coral had been bleached. 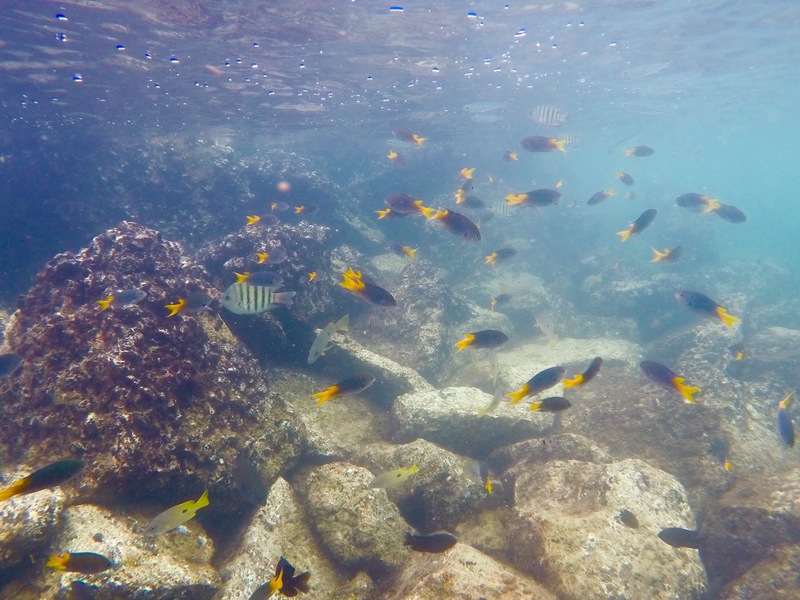 But we did manage to have a good snorkelling session in Alma Bay and saw lots of fish and beautiful coral! Wearing Stinger Suits to protect us from the jellies! 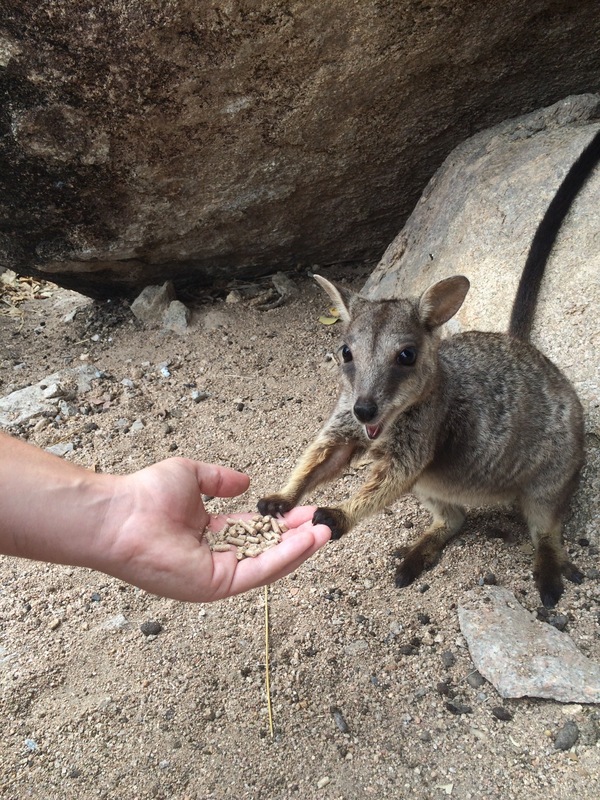 We stayed at Bungalow Bay Koala Village and made friends with all of the local wildlife. 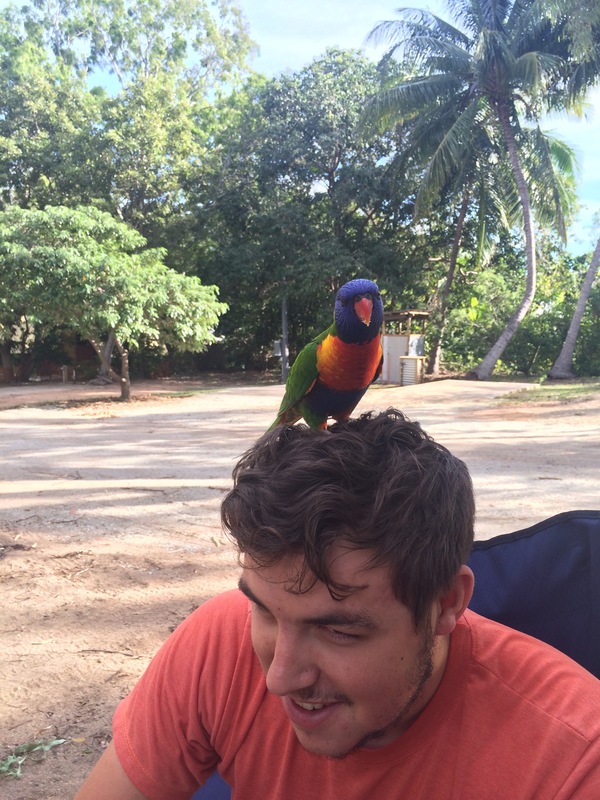 Our favourite campsite animal was Lol, the rainbow Lorrikeet who came to sit in us but a close second was Kev the koala who slept a few trees away from us. There was also a pet chicken and a possum who came to the van at 8pm prompt every night. 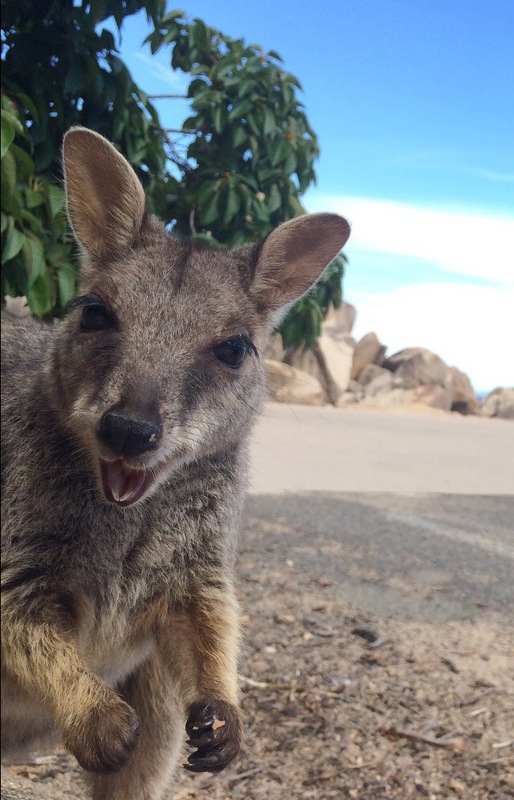 But by far the best animals on Magnetic Island are the rock wallabies who live at Geoffrey Bay because …. Look how cute they are! We have them sweet potato and they were so happy about it! I don’t think I’d be that happy for a potato, however sweet it was. As well as amazing animals the views on Maggie aren’t too bad either. 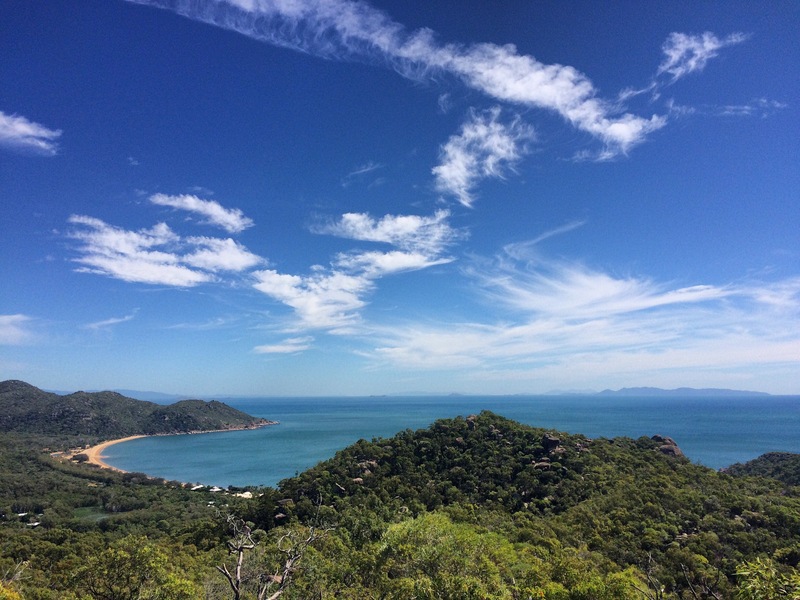 From the WW2 fort you can see all the way up the coast line to Hinchbrook island and back over to Townsville on a clear day – which is luckily what we got! And so we finished our time on Magnetic Island in beautiful weather having finally ditched the rain. Once we’d landed back in the mainland we started to head north again towards Cairns; in time to pick up my friend Elise who we were making the rest of the East Coast trip with us! After our Colossal drive up the middle I didn’t know if we were actually going to ever get the energy to move anywhere in Northern Queensland. But move we did and it was great. 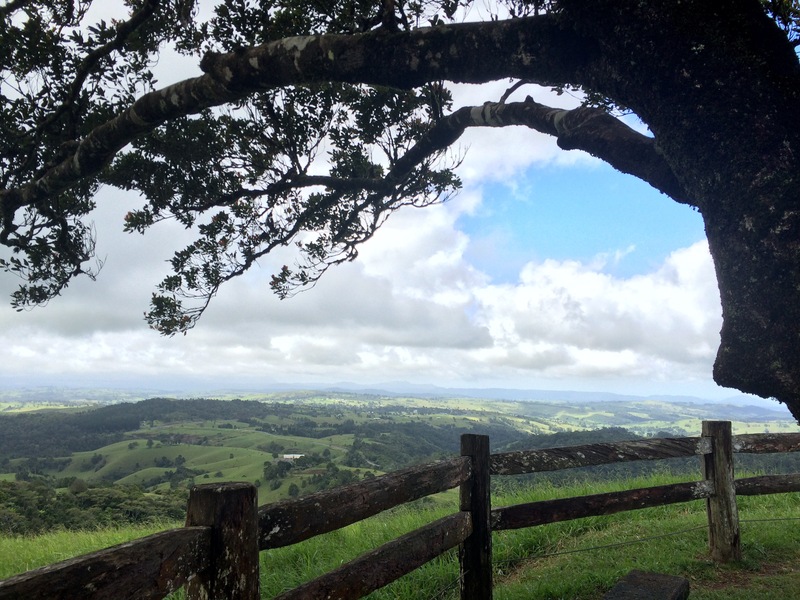 The Atherton Tablelands are a little bit like the Cotswolds with lush green rolling hills and dairy farms dotted over the dales, admittedly the rain forest is a little different but the perpetual rain was the same, as was the continuous fog rolling over the tops of the mountains. The area was once a hub of volcanic activity before Australia moved to its present latitude and the entire landscape is shaped by the echoes of past eruptions. 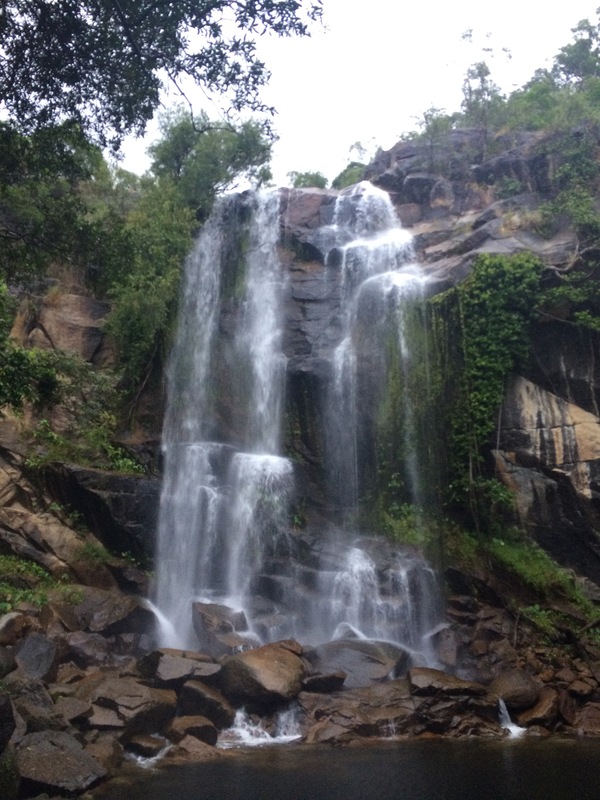 The highlight of the tectonic past are the waterfalls, which, when we arrived had recently been topped up by the wet season and were super fast and super spectacular. 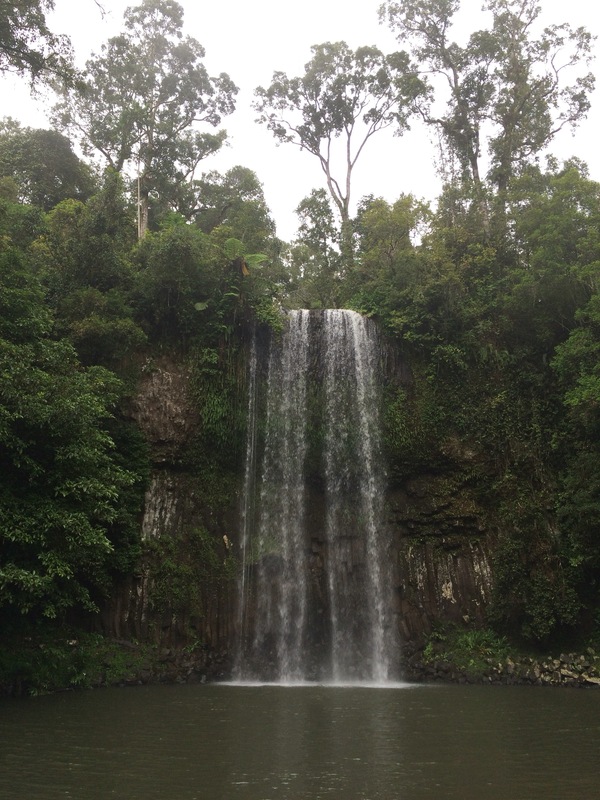 At Millaa Millaa we did the Waterfall drive, visiting Millaa Millaa Falls, Zillie Falls and Ellinjaa falls. They were all very pretty but we decided not to don our Toggs and go for a dip which I don’t regret in the slightest given the colour of the water! We also visited the ultra-marine crater lake Lake Eacham and its sister Lake Barrine. 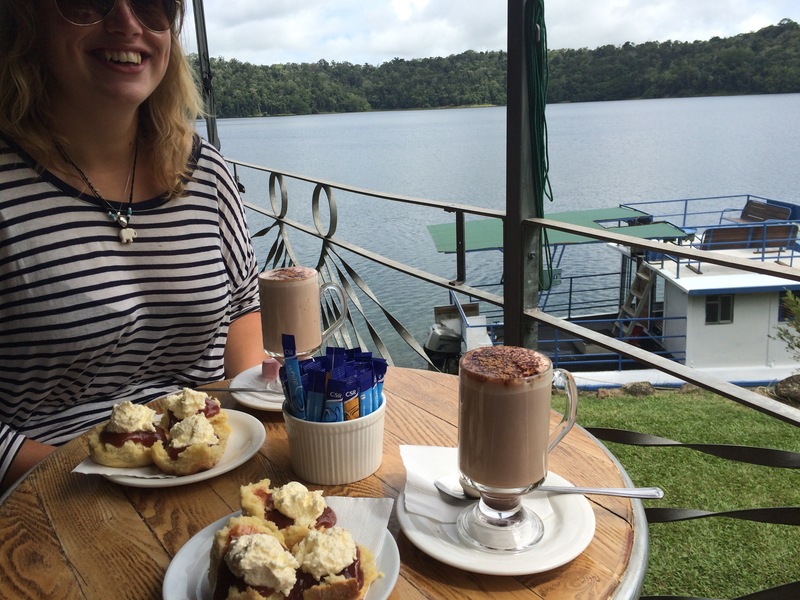 Of the two, Lake Barrine was made more memorable because of the incredibly delicious scones (with cream and jam of course) which we had with hot chocolate overlooking the water. As if in competition with its geological surroundings, the flora and fauna of Northern Queensland goes above and beyond what you’d normally find. We saw our first fresh water turtles at Malanda Falls as well as a plethora of other wildlife like tree kangaroos, possums and eventually a Platypus at Yungaburra which was very exciting! The trees are also something else entirely, especially the fig trees. We stopped at the aptly named Cathedral Fig and stood in awe of the ginormous plant. Creeper figs are parasitic seedlings that ‘creep’ up the side of another larger tree, gradually pulling it towards the ground until it’s overtaken and overgrown. It’s a bit grisly but I’m glad they do because look what they become! 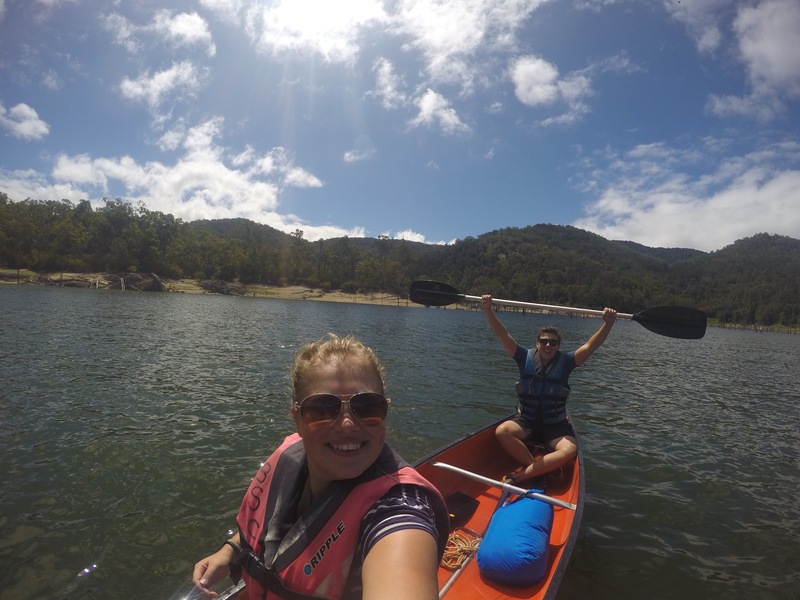 After the enormous fig trees we visited the man made Lake Tinaroo and stayed at a Scout Camp. Infinitely nicer and more exciting than any of the Scout Camps we went on, this camp had decent showers, fire pits and canoes that we could rent out for $15 a day! I think I’d remembered canoeing to be a lot more fun than it turned out to be. There was one point where we’d been paddling hard into the wind for 15 minutes, stopped in annoyance and got blown all the way back – so quickly that we actually left a wake behind. Still, the view was pretty good so it wasn’t really a wasted effort. Just north of Lake Tinaroo lies the town which gives the Tablelands their namesake. Atherton is a small town about an hour inland from Cairns and its neighbour Mareeba is where we stayed in the same place for the longest time on our trip so far. 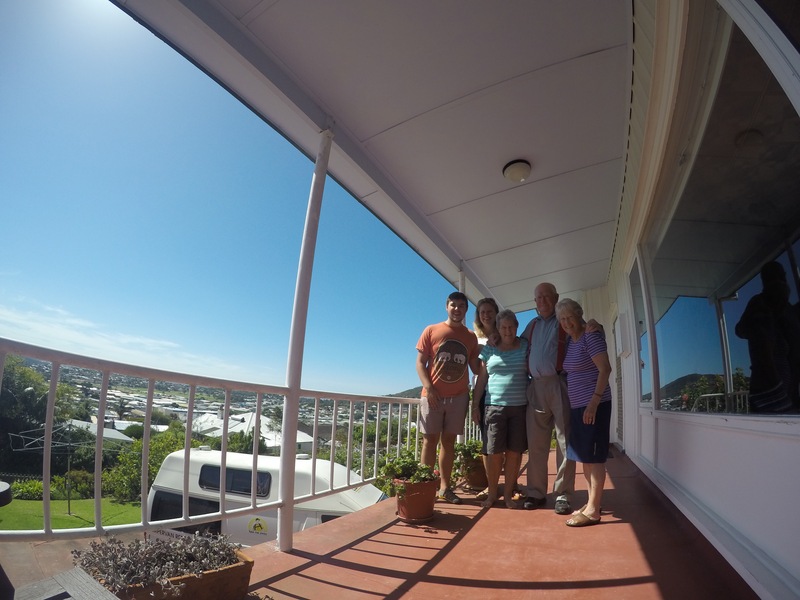 Because Mareeba is home to Anne and Jim who had us to stay for 10 fantastic days! We’d planned to stay for a few days, which turned into a week and then because we were made to feel so welcome 7 days turned into 10 and every day was easy, enjoyable and entertaining. Whilst we were at Anne and Jim’s we visited Chillagoe for the day to see the caves and Aboriginal rock art as well as visiting Anne’s exhibitions in Cairns and Mareeba and eating a whole host of new fruits like Pomalo, Paw Paw and Custard Apples from the garden. So thank you to Anne and Jim for inviting us and allowing us to recover from our epic drive. But also thank you for homemade dried bananas; for giving me an entire library to read from; for involving us in day to day life and most of all for giving us a room in your beautiful house and making it feel like our home. Jim, Anne, Panda, Ryan and I on the morning we left. And so after 10 days said our goodbyes and journeyed upwards into Far North Queensland and the tropics, complete with 85% humidity, giant spiders and chocolate pudding fruit. If humans ever live on Mars I imagine NASA will make people do all of their conditioning in the Australian Outback. 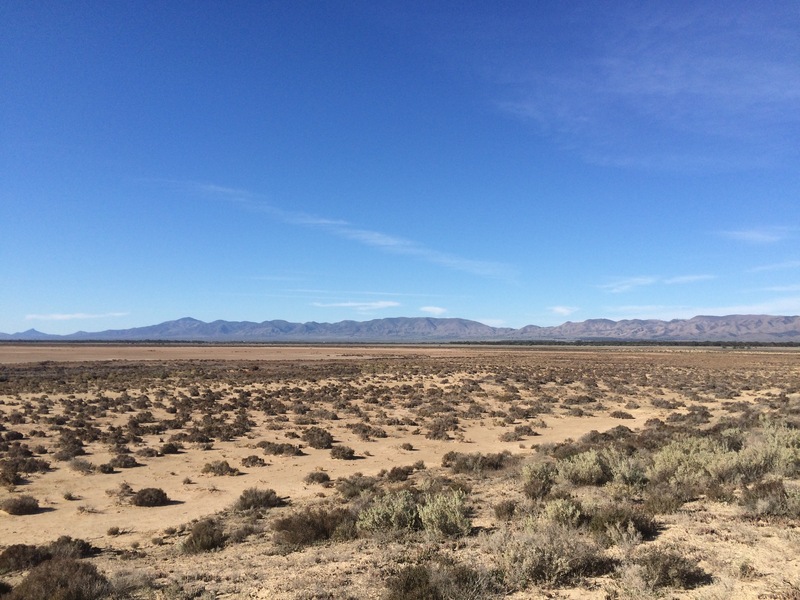 We left the friendly terrain of Suburban Adelaide and drove again westward to Port Augusta and then, after filling up with copious amount of water, sweets and fuel we headed into the Red Centre. I fell asleep as Ryan drove us away from Port Augusta and relatively manageable temperatures and woke up as we reached the outback proper. The driving between Port Augusta and Coober Pedy is hard, the scenery is flat and mostly dry red scrubland. 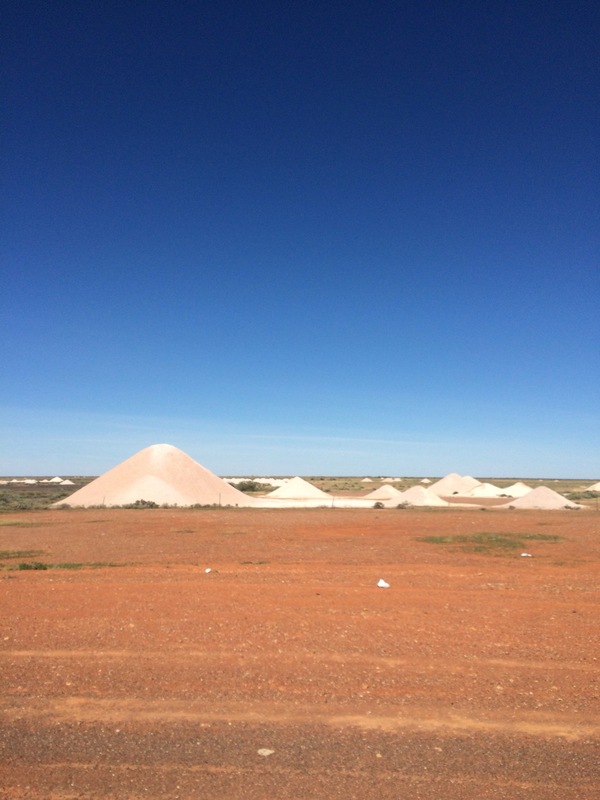 However as you approach Coober Pedy you can start to spot the tell tale signs of human life in the form of the towns iconic tipper trucks and white slag heaps that have been coughed up from the opal mines. 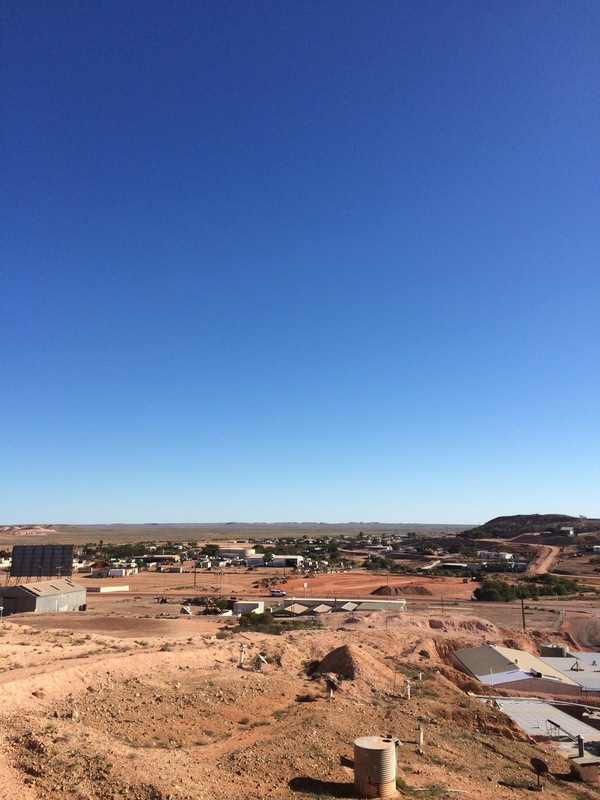 It’s no wonder people live in man made caves in Coober Pedy because the flies are horrendous. People must make a lot of money from the Opals that they find because someone would have to pay me a lot of money to live there; with the heat, the insects and the barren landscape it doesn’t have a great deal else going for it really. There are a lot of Mad Max props littered all over the place though from the last film that they staged here which were very interesting. Unfortunately the flies and the heat got worse as we headed northwards. We drove to Uluru in the same day that we visited Coober Pedy and arrived in time for sunset. To enter the Uluru-Kata Tjuta National Park is $25 each for three day entry which goes towards maintaining the park and helps support the Aboriginal Communities who own the land and have leased it to the government so we can enjoy it! 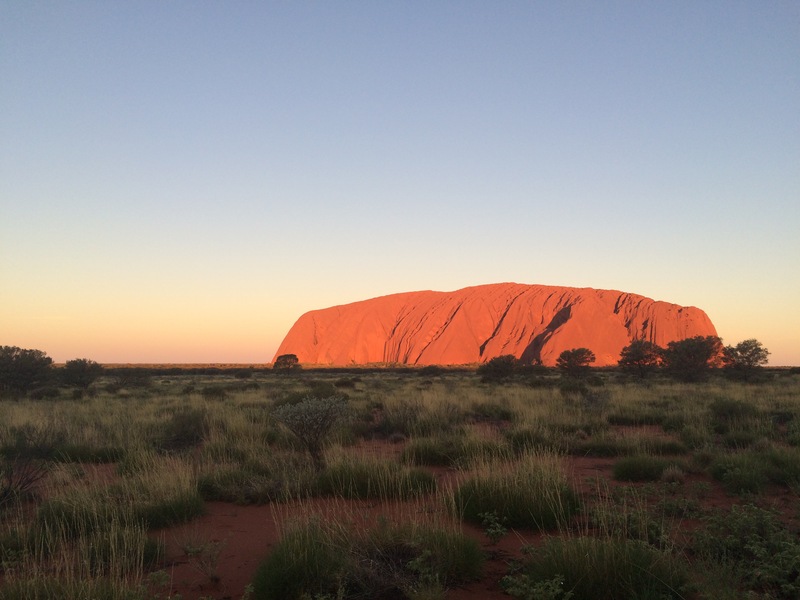 The three day pass meant we got to enjoy Uluru at sunset over and over again. Every evening was as beautiful as the last, the rock changes colour all day but it’s at it most glorious just before the sun goes behind the earth when it’s at its deepest red. I think I would have driven all of that way up and felt happy to just to see the first sunset but the beauty of Uluru doesn’t end when the sun goes down because then the stars come out and I didn’t know the sky held so many stars. 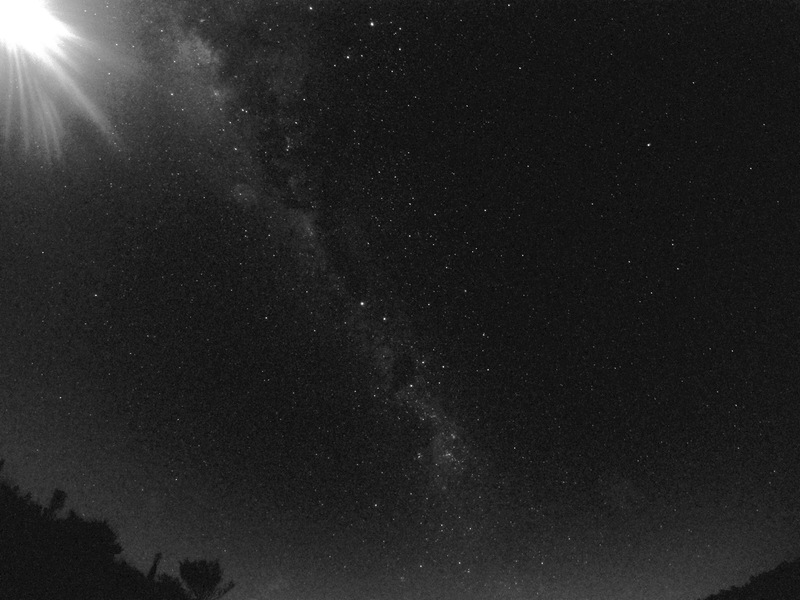 In the UK we glimpse the Milky Way on a cold frosty night but in the Outback it bands across the sky in all of its sparkly milkyness, our GoPro shot doesn’t do it justice but it’s a good effort. We couldn’t exactly have a nap the next day, or the day after that either because the heat is relentless. 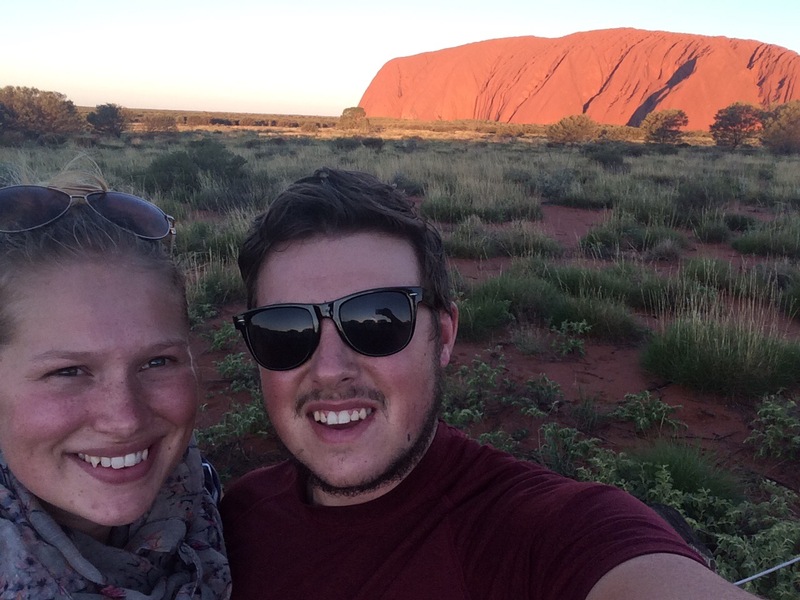 Even after a day exploring Uluru and the cultural centre we couldn’t get a wink. Lucky we’ve got air conditioning really, hats off (hell all clothes off because it’s so warm) to all who attempt the middle without it. After the magic of Uluru the drive lost some of its lustre, the landscape changes from flat to mountainous as you reach Alice Springs but it only grabs your attention for a short while before the monotony of the 19 hour drive to Mount Isa sets in. Mount Isa didn’t offer too much distraction either, however the evenings got much more interesting due to the enormous cricket/moth/bird/dragon creatures continuously throwing themselves against the window trying to get to the lights in the van. In the middle of nowhere that’s just what you need … Something huge banging repeatedly on the window and then disappearing. A real treat came after we’d left Mount Isa to head for a free camp at the abandoned Uranium Mining town of Mary Kathleen. Abandoned 20 years ago or so Mary Kathleen was completely dismantled and nothing remains but the concrete driveways of ghost houses. It was hands down the scariest place I’ve ever been, it probably didn’t help that we arrived in the dark but it certainly wasn’t made more endearing by the lack of any other human beings and cows mysteriously looming out of the darkness. In all of the time we’ve been travelling around Australia that’s the only time we’ve left a camp because we were too freaked out. Still, we drove on until we reached Queenland and the Gulf of Carpentaria. The roads here become luscious and green with cattle roaming wherever they liked and hundreds of butterflies. After 4 days solid driving we finally reached the end of our Outback adventures in the Atherton Tablelands. 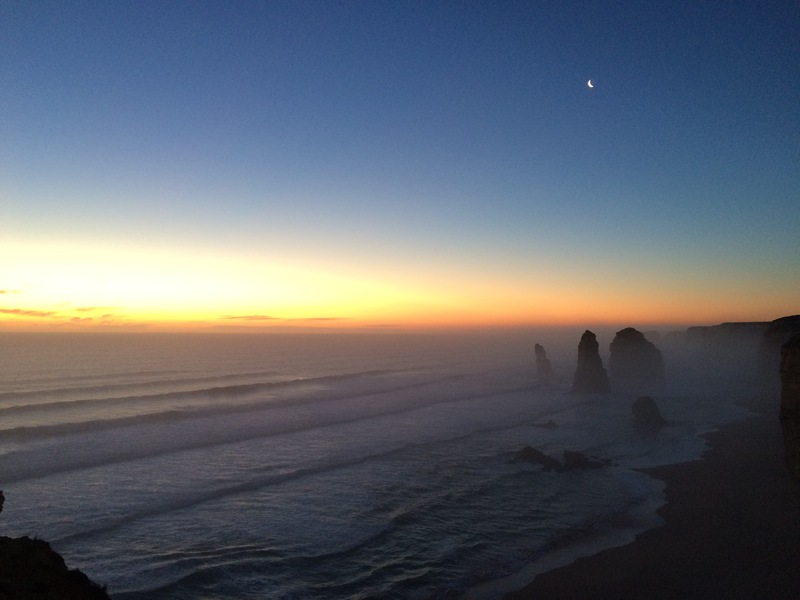 Back to water, human beings and cooler nights – THANK GOD! If you’re ever going to do drive through the outback from Adelaide to Uluru, Alice, Mount Isa to Normanton and across to Far North Queensland take this advice: take water, air con, Coca Cola and most importantly a friend; it’s a long trip and there’s no going back but when you finally arrive it will be worth every second. Our last blogpost finished in Western Australia (WA) and we’ve seen a lot and driven a very long way since then. But our epic road trip has been rewarded by some long awaited visits to our fantastic family and of course some incredibly beautiful places. After Perth we headed south towards the Margaret River Region. The south west corner of WA is astonishingly similar to home, mainly down to the weather … I think it rained nearly everyday whilst we were there. But also because landscape is full of rolling hills with hundreds of dairy farms and limestone caves just like Castleton and blustery shorelines, which is standard for anywhere in the UK. The two major exceptions in the ‘similar to home’ landscape are the trees and the boulders. Because WA doesn’t do any old trees or boulders, OH NO, it does them on steroids so they’re enormous. Tall timber country is exactly what it says on the tin, with the Karri and Tingle trees reaching up to 50m. Obviously the natural Giant’s of the Valley are in competition with the boulders on the coast. 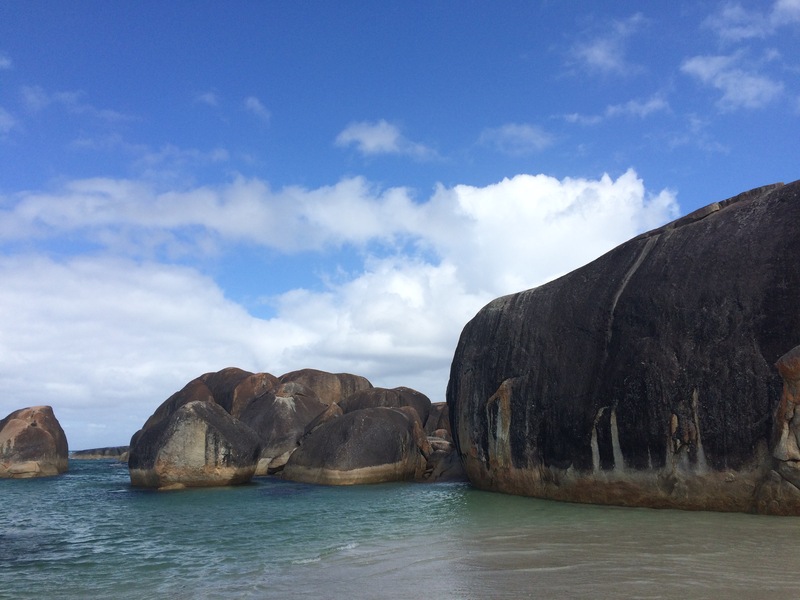 The gargantuan stones at Elephant Rocks were a highlight of the trip down and were so so beautiful – and there was no one there!! And so we journeyed through the weird and went onto the wonderful. In Albany we made our first house call and went to stay with The Ardens! We’re very lucky to be travelling constantly but it’s so nice to stay one place with the comforts of a home and familiar people. Better still when those people are so welcoming and they have an endless supply of beers, puddings and ladder golf. Things did get a bit competitive at one point over garden bowls; I’m happy to say that Joan and I beat Ryan and Betty, although I’ve forgotten the score. However we reconciled over Leo’s Happy Hour (now eternally famed) with freshly prepared crab on crackers and a cold stubby. Thanks to Joan, Leo and Betty for inviting us and having us to stay, it was lovely and we’ll never forget it! 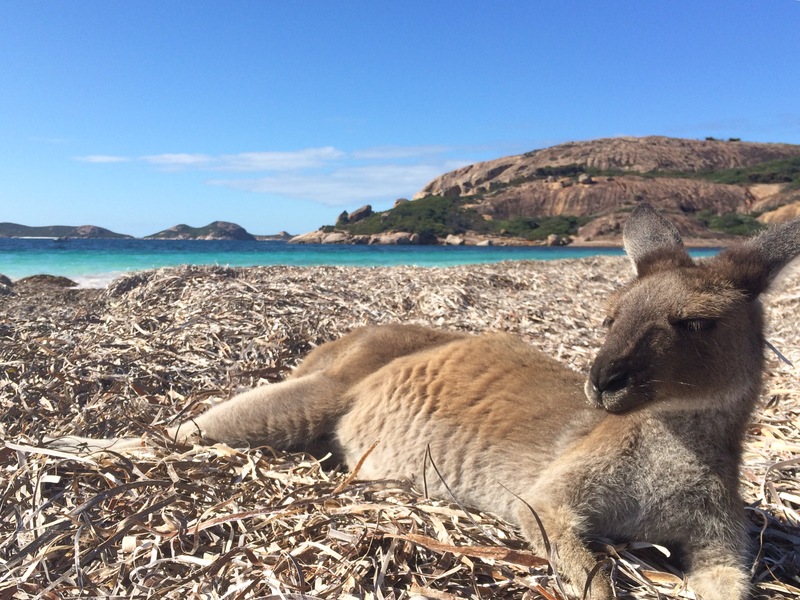 And the kangaroos are actually that chilled out and it was absolutely breathtaking. 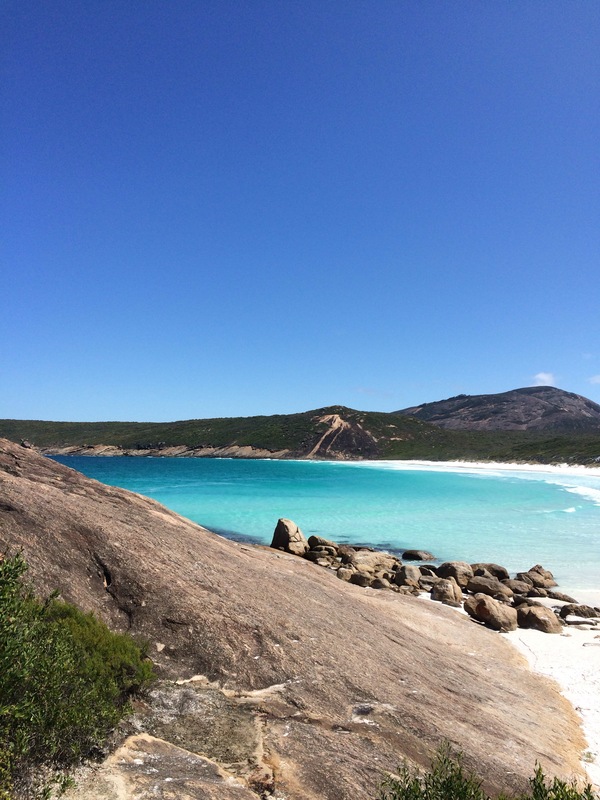 This might be my favourite beach is the whole of Australia! Unfortunately we had to camp quite far away because we forgot that it was the Easter 4 day weekend and that other people quite like going on holiday too. We spoke to one woman who had finally (at one in the morning) got a space after queuing for 7 hours! But it didn’t deter our exploring and we had a great time before our epic drive. And then we truly started the bulk of our epic road trip up the middle! Western Australia is amazing. Everyone we’ve met whilst in Australia told us that we would love the west coast and we weren’t disappointed. 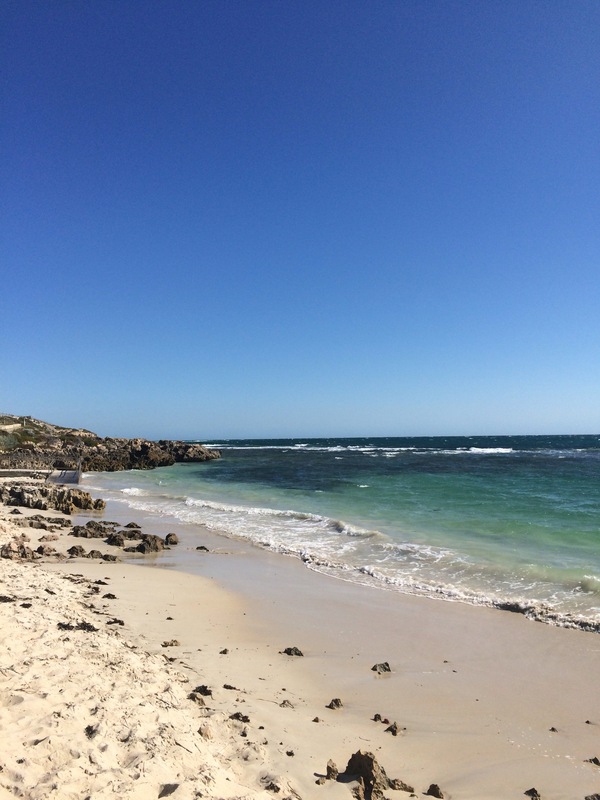 Perth is our favourite city and its surrounding beaches, towns and countryside are all stunning. 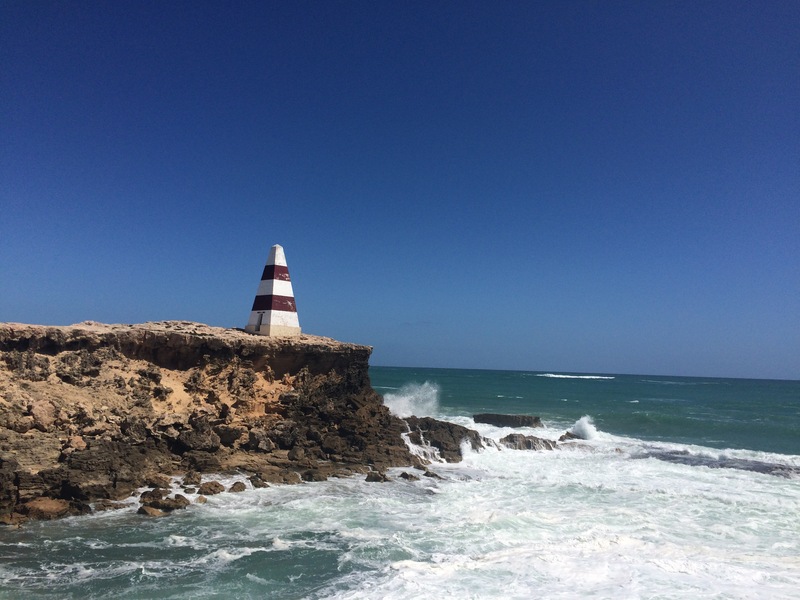 The only downside is that we didn’t have enough time to travel northwards towards Exmouth and the Coral Coast – but we’re working on a plan to come back. 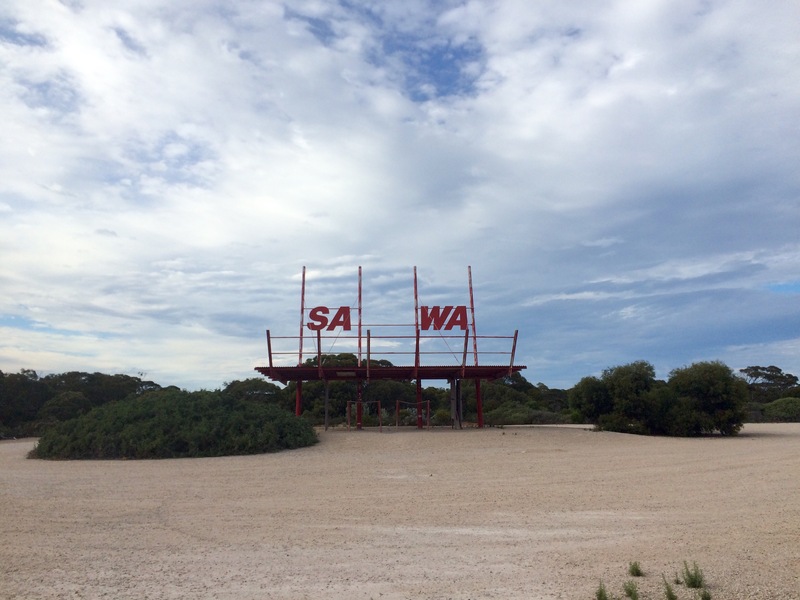 We spent two days crossing the Nullabor at the beginning of March and spent 8 days discovering the area around Perth. And as a little treat to ourselves we decided to stay in the same place for the whole time at a campsite which had a hot tub! Hot showers, a camp kitchen, power and a hot tub – absolute perfection. 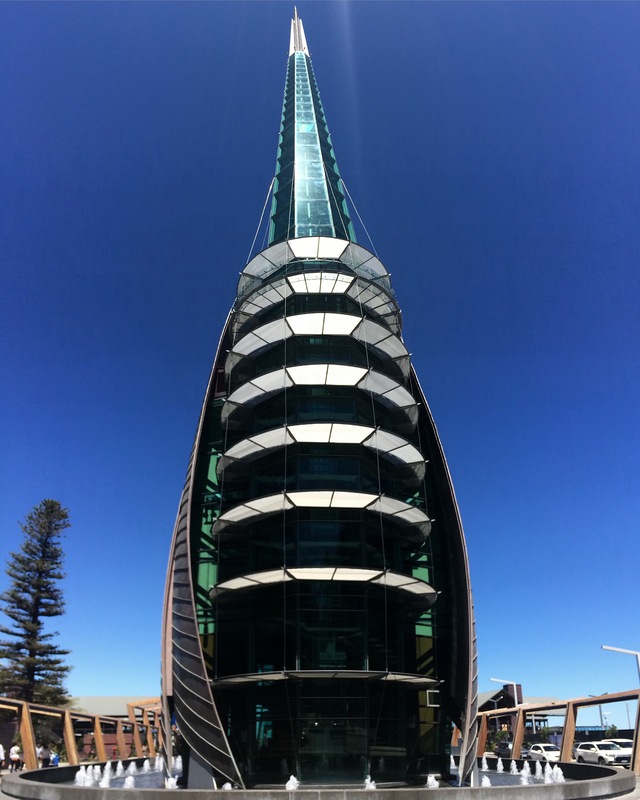 The site was just above City and Scarborough Beach, which are slightly outside the CBD and were a perfect base to explore from. We packed a lot of things into 8 days so we decided to jot down just a few of our favourites. 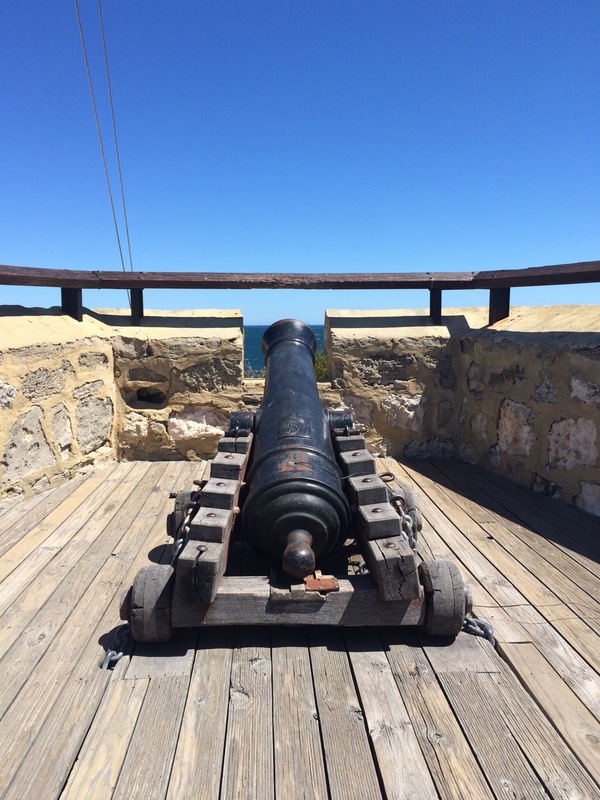 Our top things to do in and around Perth! Perth is an easy 3-4 degrees warmer than neighbouring Fremantle and we appreciated the chance to go for a swim and we cooled down, FAST. The water in the west is definitely chillier than the east coast. 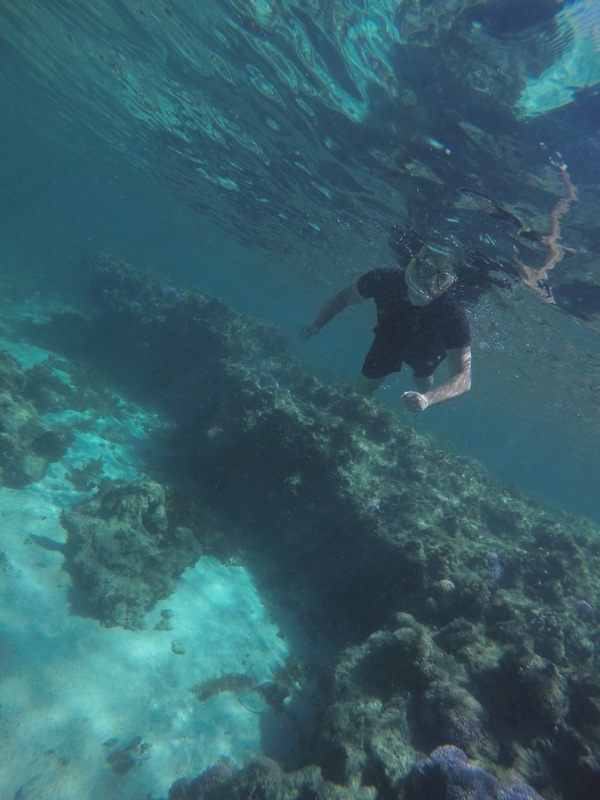 But we weren’t going to be put off by a bit of cold, so we persevered and snorkelled for two awesome hours. City, Scarborough and North beach are surfer’s hotspots but the sheltered cove at Mettam’s Pool makes it perfect for snorkelling especially for Ryan who’s a bit of a newbie. It’s a bit pricey to get out to the island ($79 each) but it was worth it. 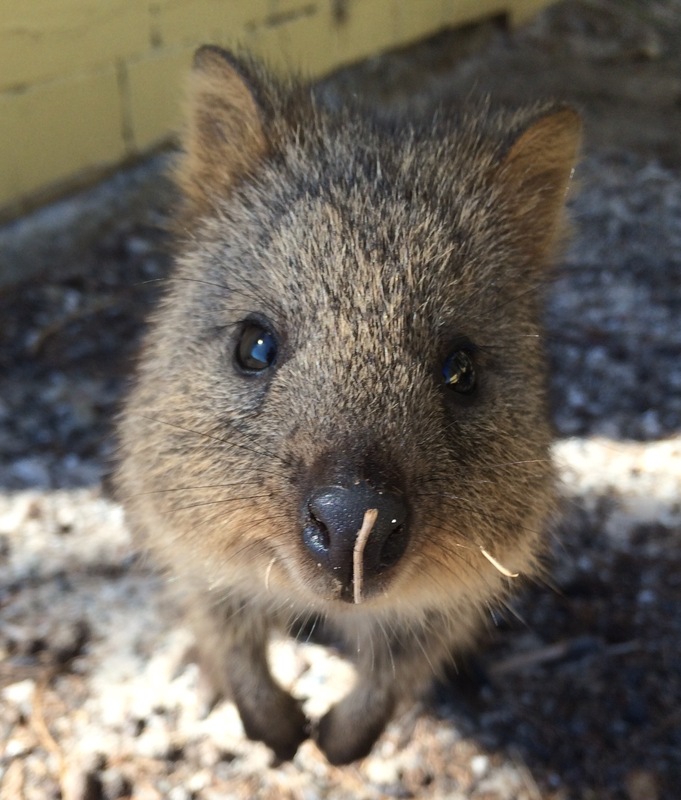 Aside from its stunning scenery Rottnest is home to hundreds of super friendly quokkas, who just love to have their photos taken. I wanted to take one with us but we couldn’t fit it in the rucksack with our snorkelling stuff. The island is as beautiful below the surf as it is above. We spent the afternoon playing at Salmon Beach where we saw hundreds of fish, lots bright blue, yellow and pink coral and one octopus. 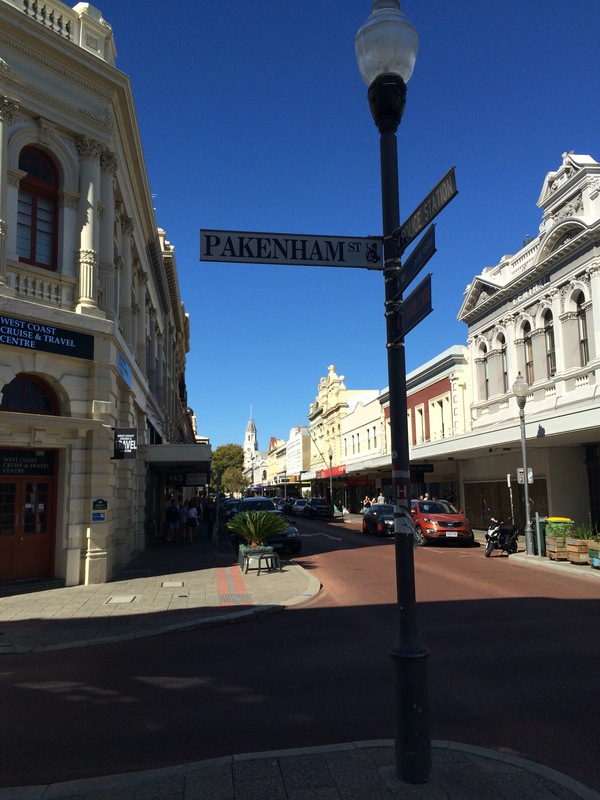 We timed our first visit to Freo so that we could visit the weekend food markets which were good fun to walk around. Freo itself is made up of lots of lovely old buildings with boutique coffee shops and vintage emporiums, it’s also got a Ben and Jerry’s outlet which we stopped at (twice). The city also features the beautiful Round House which fires a cannon at 1 o’clock to allow ships in the olden days to set their chronometers to the right time. We had fish and chips at Bathers Beach, walked along the harbour and watched the world catamaran racing championships, we’d definitely come back to Freo. We don’t do a lot of tours because we don’t have a lot of money but we stretched out in this one and I’m really glad we did. We spent three hours on The Great Escape and the Doing Time tours which were both given by old guards and they were both fantastic. 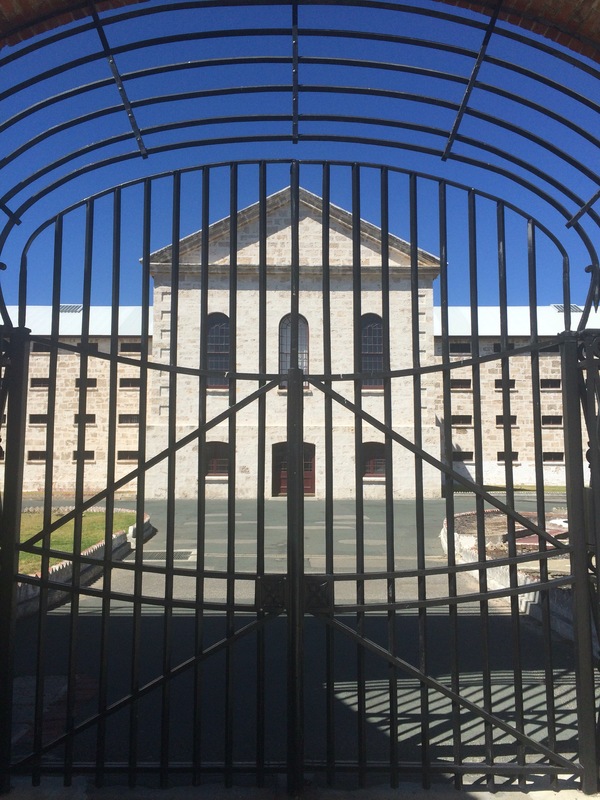 We found out so much about the prison and its former use as a convict barracks and then as a more modern high security unit. It was really amazing to be told how many ways people had tried to escape, especially the Postcard Bandit who is infamous in Australia for escaping and then sending the police photos of himself outside police stations. Our guide Jim was head of security at the time of the Postcard Bandit’s legendary escape and I think it still burns a bit. Also gross to discover that the prison, which only closed in 1991 had no flushing toilets in the cells so inmates had to empty their buckets everyday outside – grim. It’s really strange hearing a traditional peel of English church bells coming from an ultra modern building but it’s also really lovely. 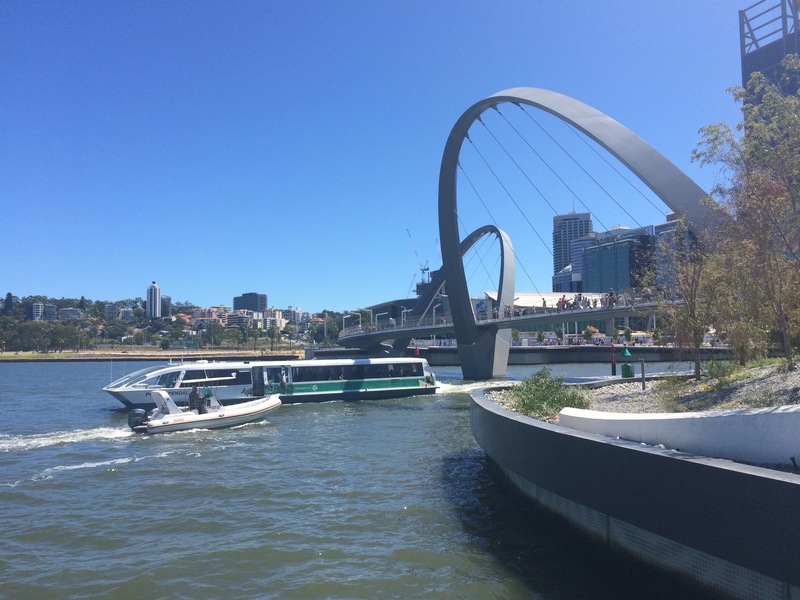 The bell tower, home to the 18th century bells from London’s St-Martin-in-the-Fields, is surrounded by the newly refurbished Elizabeth Quay where you can look over the CBD and the river from the quirky bridge. While we were there it was also home to the Perth Fringe Festival so there was a fair, pop up bars and a street length chalkboard. King’s park has the best views of Perth. We spent labour day here (more of a coincidence than intentionally because we constantly forget what day it is) so it was really busy but it had a great atmosphere. The ANZAC memorial opens up to give incredible views of the city skyscrapers and the bay, plus there are lots of trees to sit under and walks to meander down. 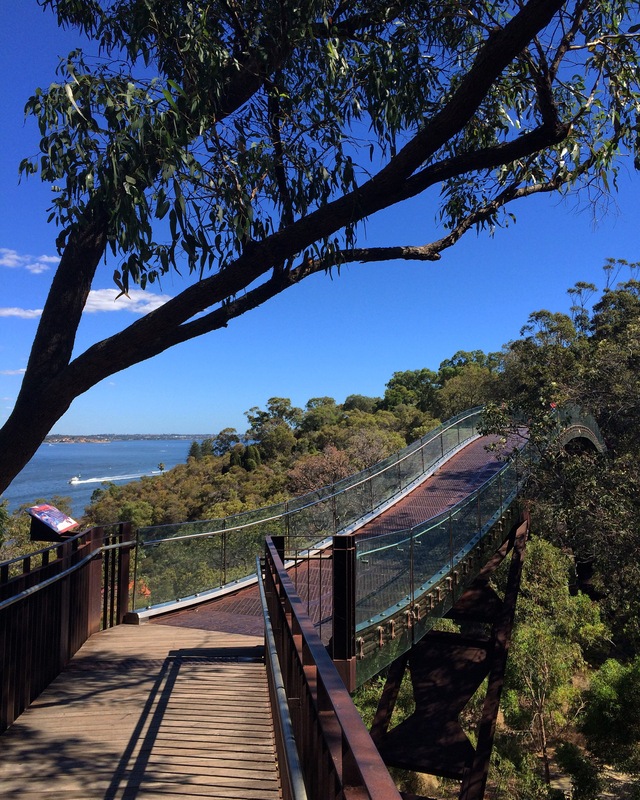 The best walk is the federation walkway which goes through the Botanical Gardens and has a tree top bridge perfect for seeing birds, plants and the river below. So far on our travels we haven’t found anywhere that’s made us feel so at ease as Perth. It feels just enough like home to be comforting but the sun, sea and sand make it a perfect city to be in. Perth, we’ll be back! South Australia: Blue skies and long drives. 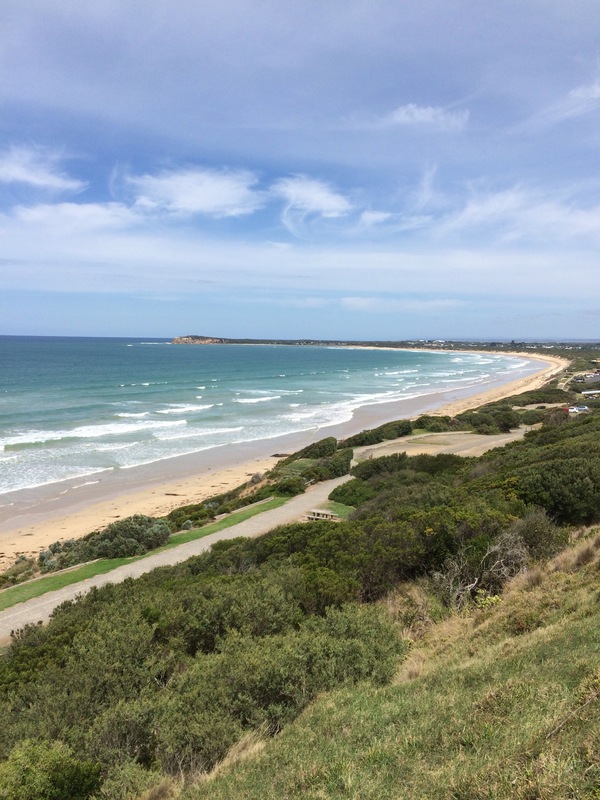 We finished the Great Ocean Road on Valentine’s Day (how romantic) and set off towards Mount Gambier after a very welcome free hot show from Portland Town Council. 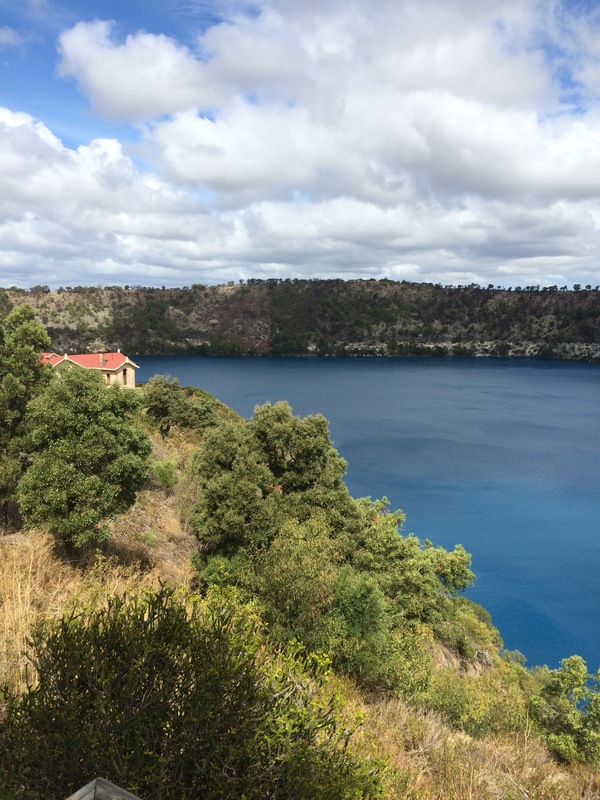 Mount Gambier is right to be proud of its Blue Lake because it really is very blue. It sits in a volcanic crater, just below the water table and changes colour over a few days in the spring from a dull grey to bright turquoise and then changes back again when it goes cold. The town also features Umpherston sinkhole which is a collapsed cavern that was cultivated to look like English Edwardian Gardens. The ivy hangs over the side of the bowl and creates a cascading effect. Its a little like being inside an enormous grotto at a stately home, it’s very pretty. Over the next few days we saw a few sinkholes and walked up to the edge of Mount Schank, which is a lake-less volcanic crater but is shaped exactly how you’d expect a volcano to look. Made all the more interesting by its resident goat. … and towards the wonderful free campsite at Kingston S.E. which overlooks a jetty that gave us an amazing sunset that evening. We set off the next morning after the visiting Kingston S.E.’s giant Lobster and were travelling along quite nicely until suddenly we weren’t. 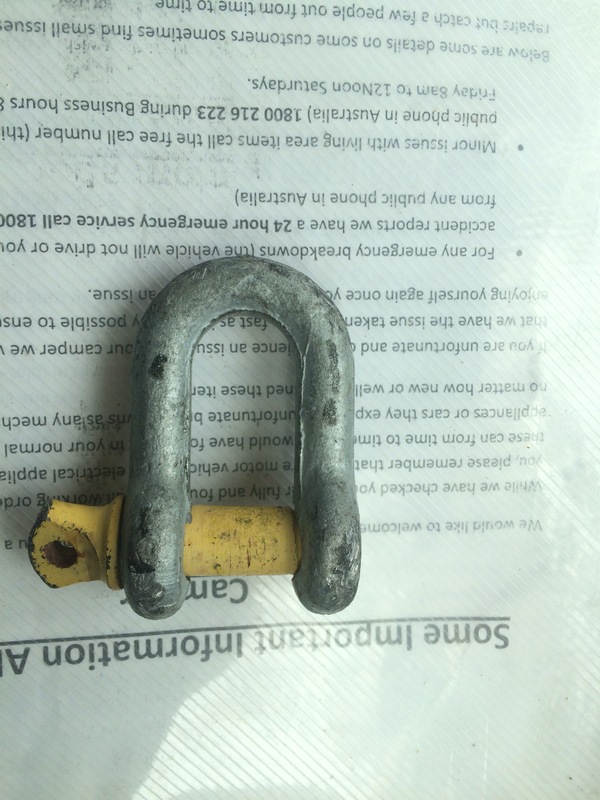 We’d been hit by a flying d-lock. A passing car flicked the lock into the grill of our van and it wedged itself into the air conditioning radiator. To our huge relief though it’s not as bad as it sounds or looks. It didn’t break anything and the air conditioning still works so we won’t be sweating it out on our way up to Alice Springs next week. Panic over we headed to Adelaide. People said that Melbourne is like Manchester, if that’s true then Adelaide is like Sheffield. It’s relatively small with some very attractive university and gallery buildings alongside some large boring modern ones. There’s a bit of a hipster vibe going on in the city centre and I quite liked it although there isn’t that much to do. 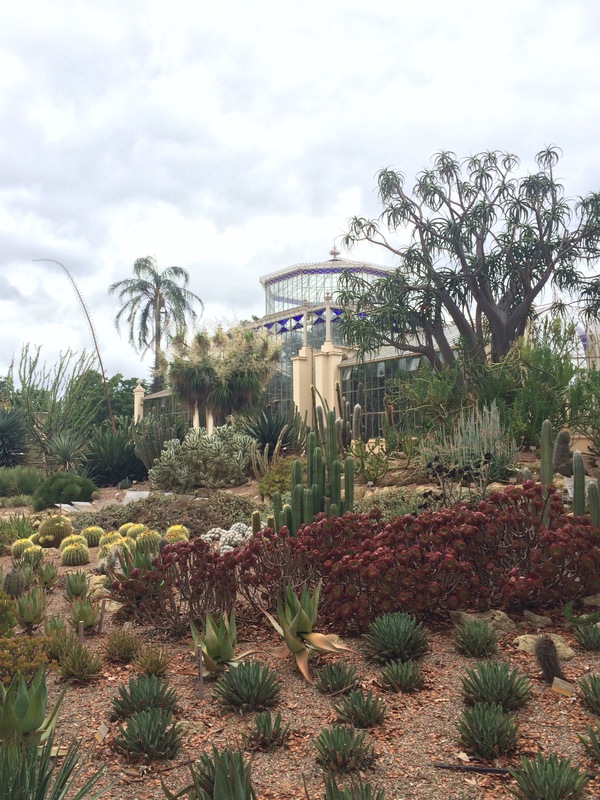 We spent a good couple of hours walking around the botanical gardens which had a lot of different plant areas. The tropical glasshouse has two carrion flowers, they only flower once every 7-10 years and they smell like rotting flesh – luckily for us they’d finished flowering when we arrived. We went to the South Australia Museum which had lots of whale bones and a large Aboriginal collection. 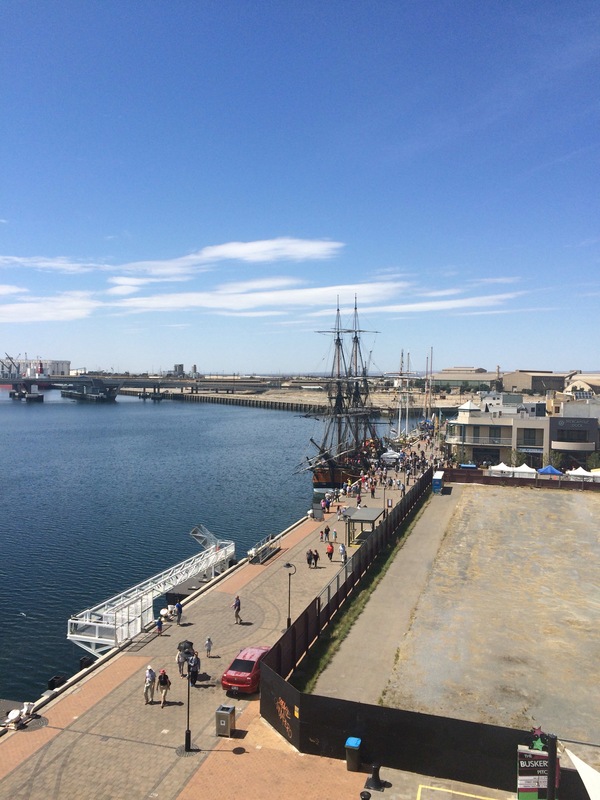 But the best bit was Port Adelaide, where we visited the maritime museum and got another look at HMB Endeavour which, we think, is following us around the country. It’s heading to Perth next. After Adelaide we had a decision to make, we could either head straight to Port Augusta (to cross the Nullabor) or go down the Yorke Peninsula. So we dawdled about for a bit and ended up heading down the coastline to the cape. 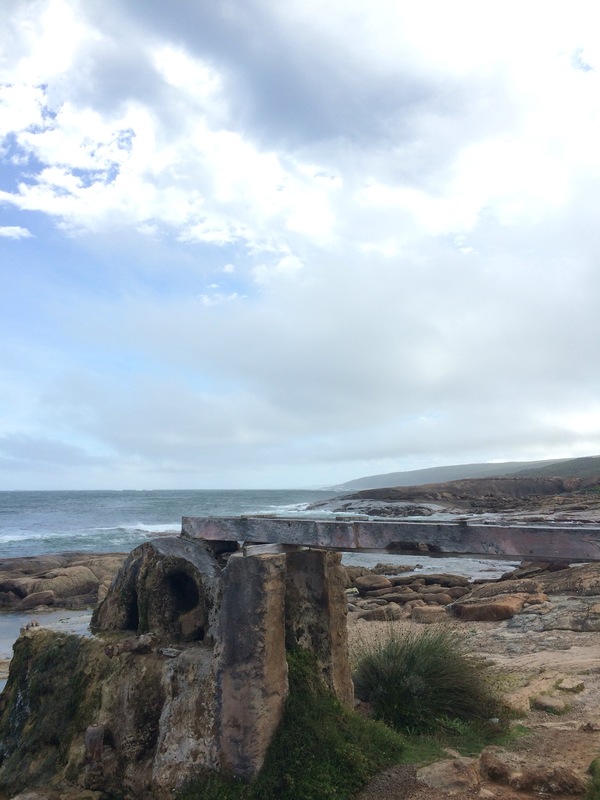 The Innes National Park which is at the cape of Yorke Pen. is very pretty with some exceptionally ugly lighthouses. 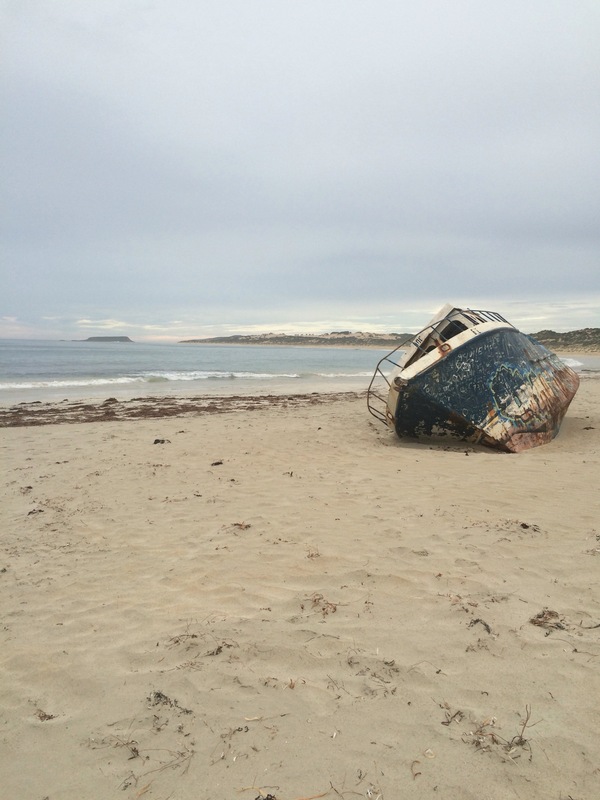 We stayed on a good campsite in the national park that had lots of kangaroos and a fishing boat wreck on the beach. We had to write a day off for rain and then we set off back towards the mainland and visited another couple of pretty bays on the way up. 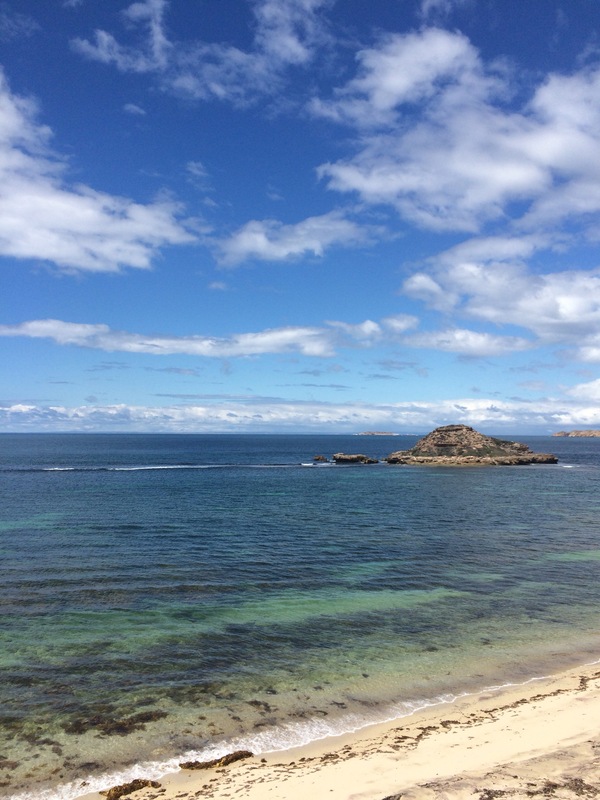 After that, we spent the next few days journeying down and back up the Eyre Peninsula. There aren’t a lot of backpackers there and it’s probably because there’s not much to do. If industrial fishing and industrial farming are your thing then it’s a haven but aside from a few beaches we didn’t do very much apart from driving, but hey- live and learn, we won’t be hurrying back. We did try some Oysters in Coffin Bay though, but we definitely won’t be repeating that experience, whether in Australia or at home, ever again. So we headed back up to Ceduna (the start of the Nullabor), we stopped at Streaky Bay and saw a cheeky seal stealing fish out of the fisherman’s nets on the jetty. And then we started heading west on the Nullabor. The Nullabor. Bor. Bore. Boring. No, it’s not that bad really. There isn’t much to look at except the road, I still think we saw a dead camel though. We swapped every two hours so it was fairly manageable. Plus we got to listen to the whole of Harry Potter and the Prisoner of Azkaban on audiobook – lucky us! 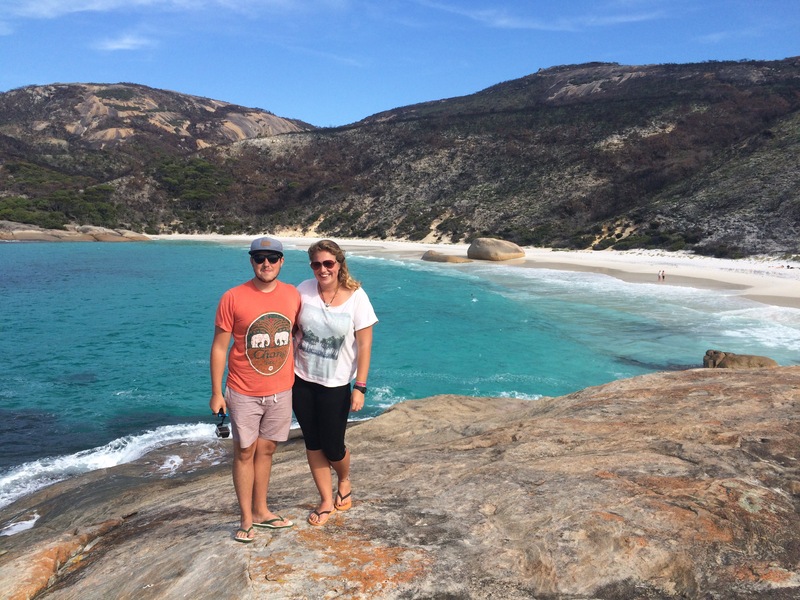 And all of a sudden, (well actually a three day 1000 mile drive) we were in Western Australia! Wooohooo! Next stop, Perth. This is a really late blogpost so I’m going to post a few in quick succession to get up to date with where we are now. 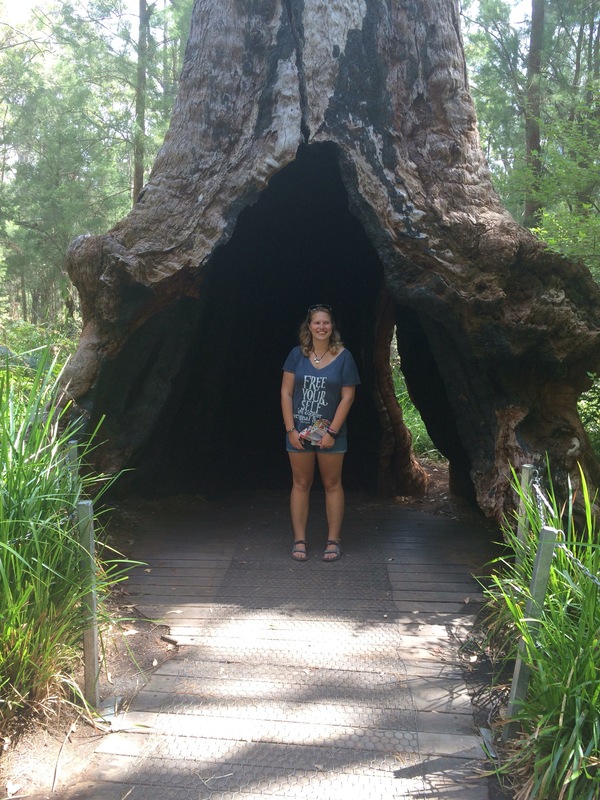 This post is about Victoria, the next one is about South Australia and the third, and most recent will hopefully be about our time in WA. 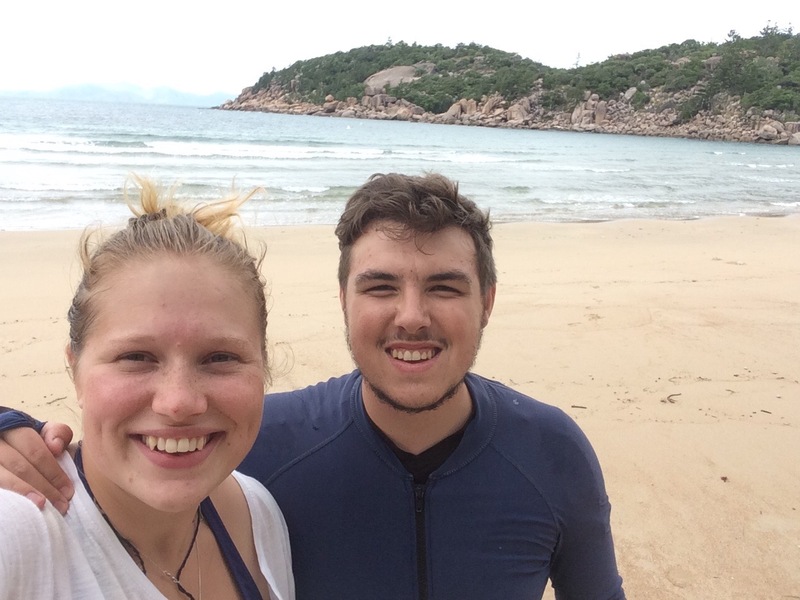 At the beginning of the year, after a quick check on our finances we thought that we could afford to sacrifice a couple of weeks travelling in order to earn some money. So we made the rather fateful decision to travel from Melbourne to Shepparton (just north) where we’d heard that we could make good money picking pears. Turns out we were wrong. Basically picking pears is not easy money, it’s terrible work, where you get a lot of scratches and no pay. Well not no pay, but it turned out we got paid on average £3.50 an hour. If we were trying to get our 80 days for our visa then it might have been worth it and we might of improved eventually but just to ease our spending it was, frankly, un-pear-able. However we did manage to get work on a vineyard for a couple of days which was much better and we met some great people who were staying on the same campsite but after two weeks of watching endless DVD’s from the local library and only finding 5 proper days of work we decided to cut our losses and leave. 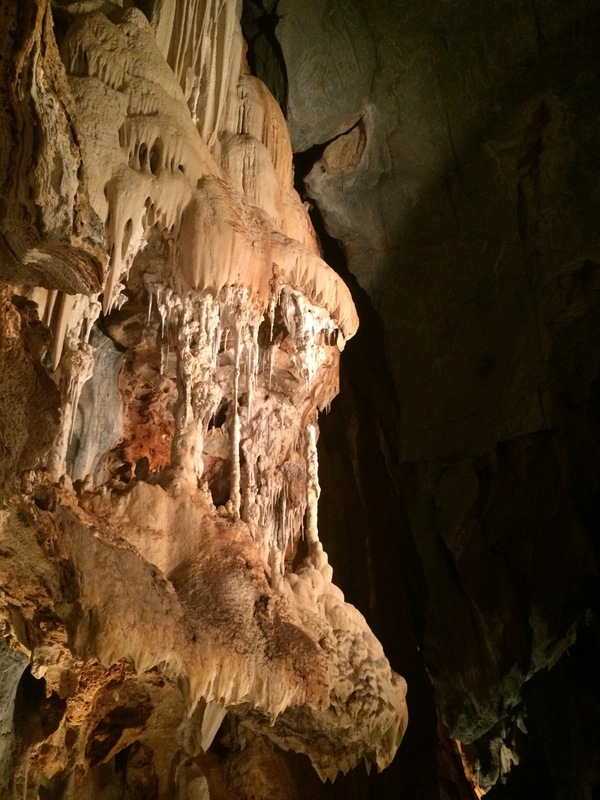 So after a dis-pear-ing start to February we left and headed to Bendigo in search of gold. 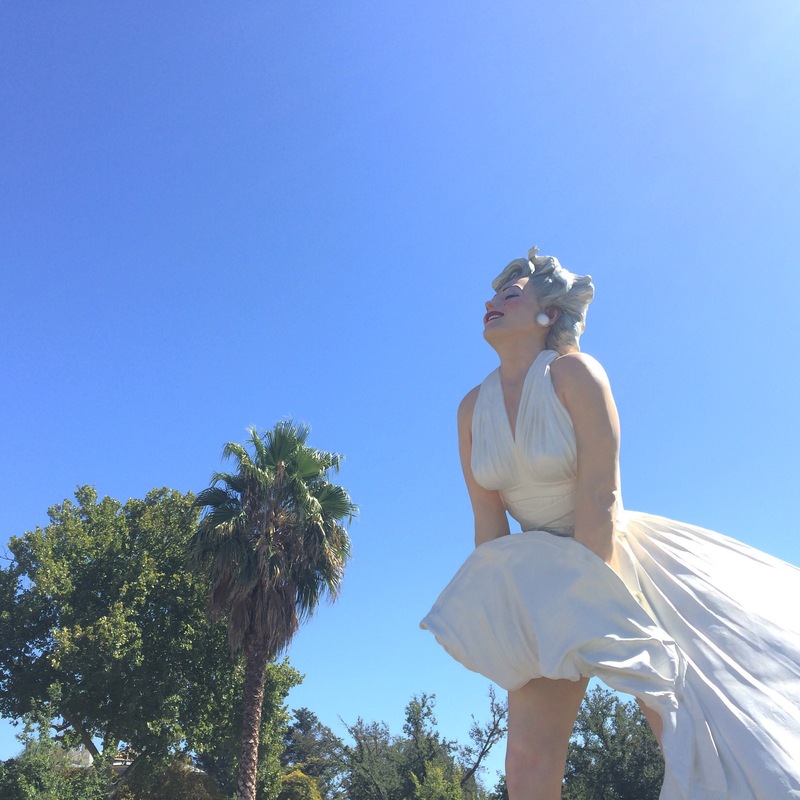 Bendigo and Ballarat were once giants in the Victorian goldfields. Thousands of people flocked to the mines to prospect and discover their fortunes and the results are still striking. After driving for miles through dry bushland the classical Parisian facades of Bendigo are an enormous surprise and very beautiful. As are the gardens which surround them, mainly Rosalind park which sits at the centre of the city. 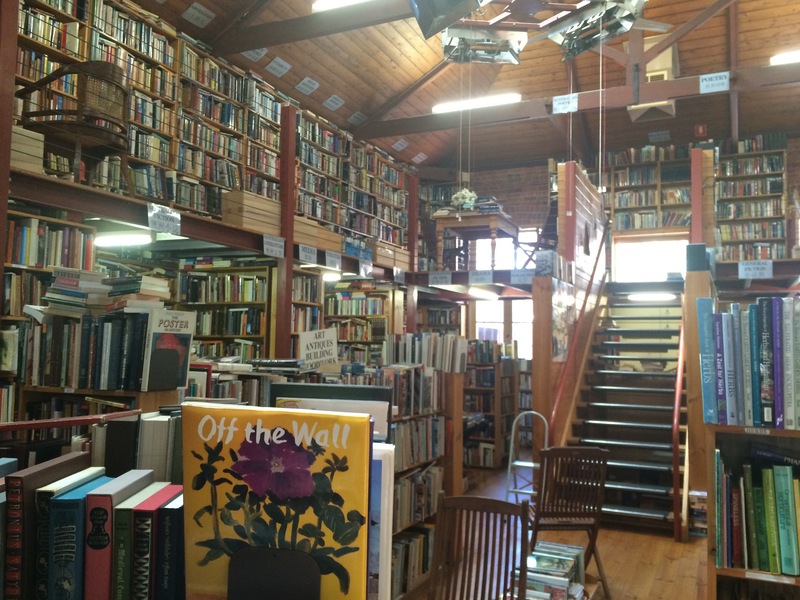 After spending a couple of days in Bendigo we travelled onto Daylesford (the spa capital of Victoria) to taste the mineral water – which was disgusting. 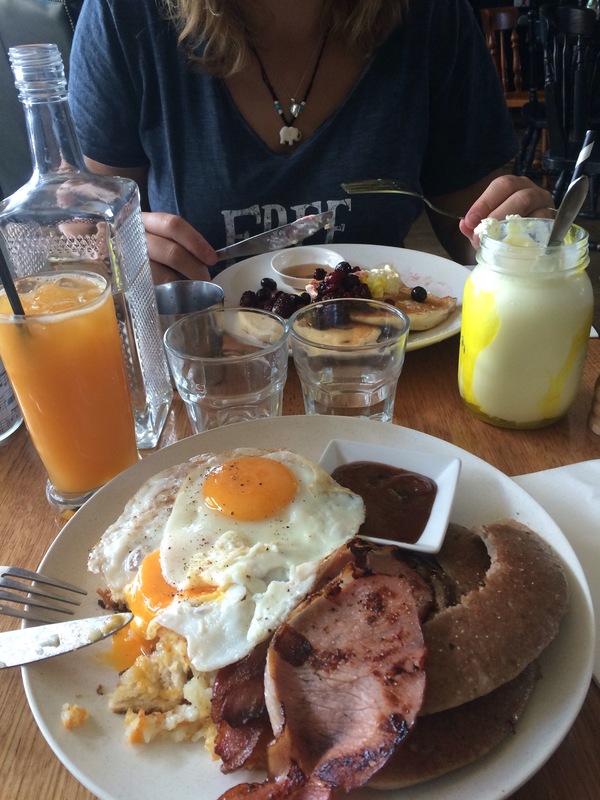 And then onto Ballarat, where we visited a few sights but the highlight was definitely breakfast at Sutton’s House of Music! 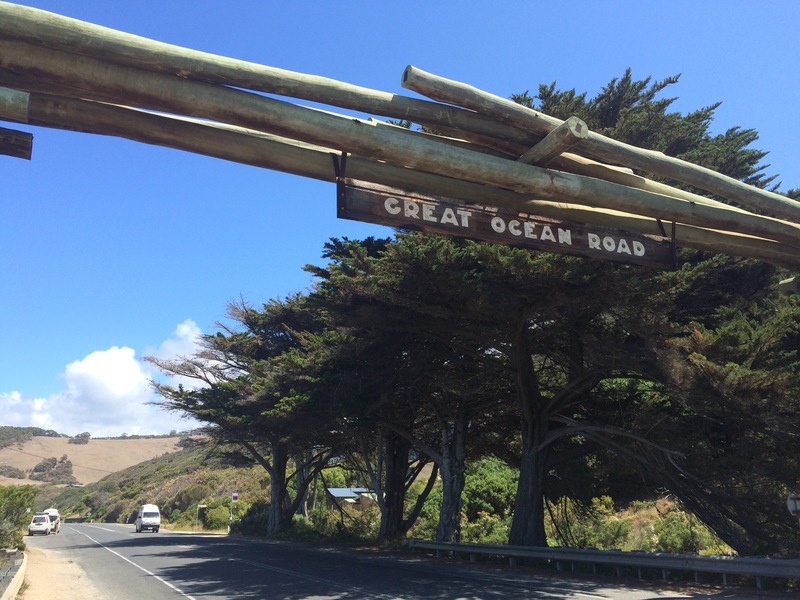 After exploring the goldfields we headed back to the coast to start the Great Ocean Road. 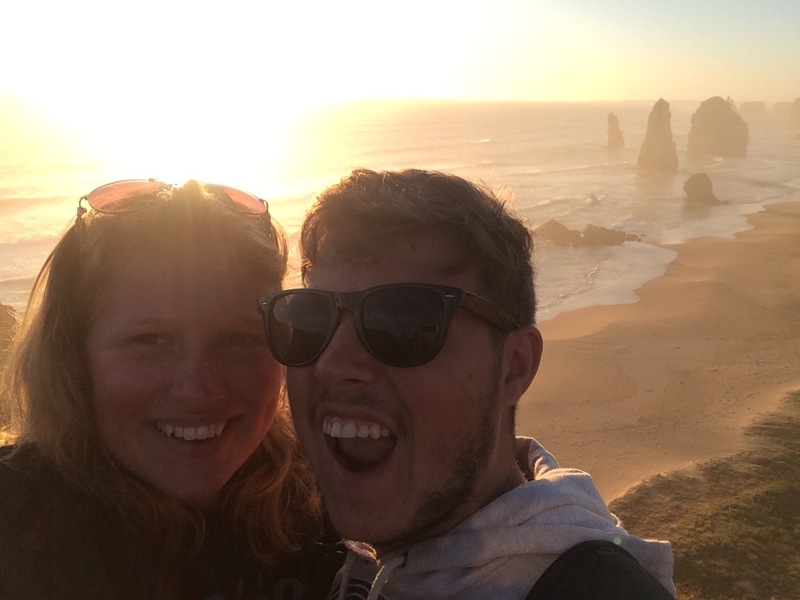 Our first camp on the Great Ocean Road (GOR) was just outside of Geelong, about an hour south of Melbourne. 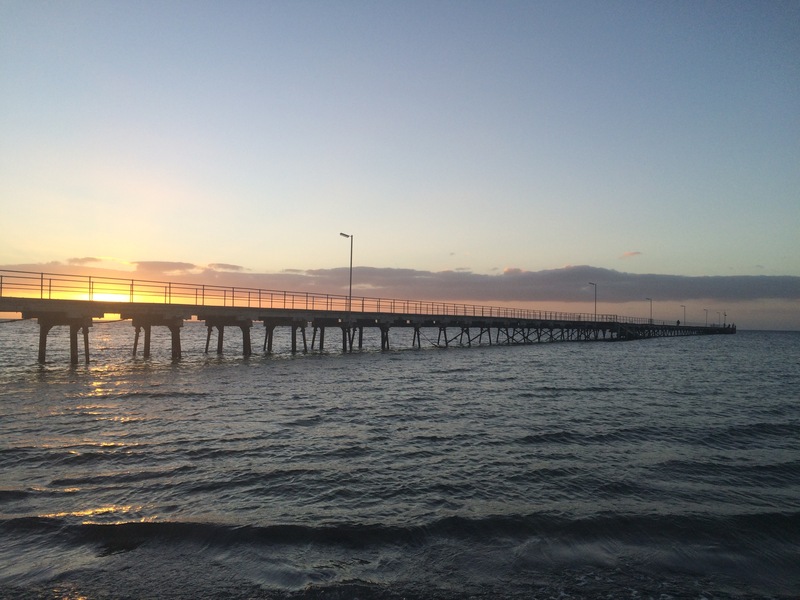 Geelong is another resplendent Victorian town and has a great sea bathing pool with dive boards and most importantly free hot showers, which were very welcome. 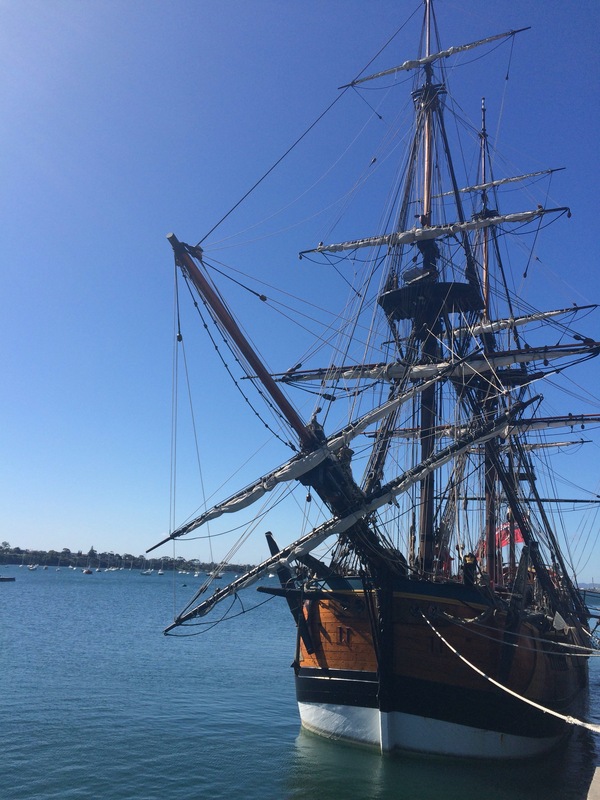 While we were there the jetty was also the mooring site for the impressive HMB Endeavour, which is a replica of Captain Cook’s ship. Apparently you can pay to be part of the crew, which I definitely wanted to do… the only tiny glitch is the price, the journey from Geelong to Adelaide was $1995 so we decided to give it a miss this time around. We met up with some friends from home in Geelong and spent a couple of sunny days body boarding at Torquay – the home of Ripcurl, before starting the GOR. From Torquay we headed west towards Lorne for ice creams. Lorne is very pretty but the countryside around it was really badly damaged by bushfires over Christmas. 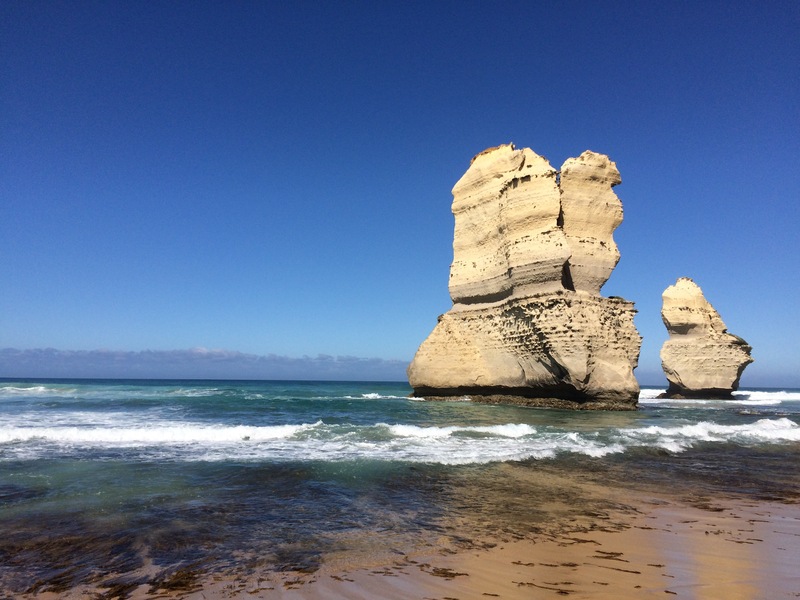 We stayed overnight and left the next morning to make the drive to The Twelve Apostles. We stopped at Princetown and went to visit the famous 12 at sunset and it was incredible. There were quite a lot of other people there but it didn’t break the enchantment. We gazed at the sun as it disappeared and watched the Penguins reluctantly come out of the sea and scurry across the sand to their burrows. It was breathtaking, one of the most beautiful things we’ve seen in Australia. When we got back to the campsite we realised that we’d been invaded by Kangaroos – all in all it was a very good day for nature! The following day was long but spectacular. 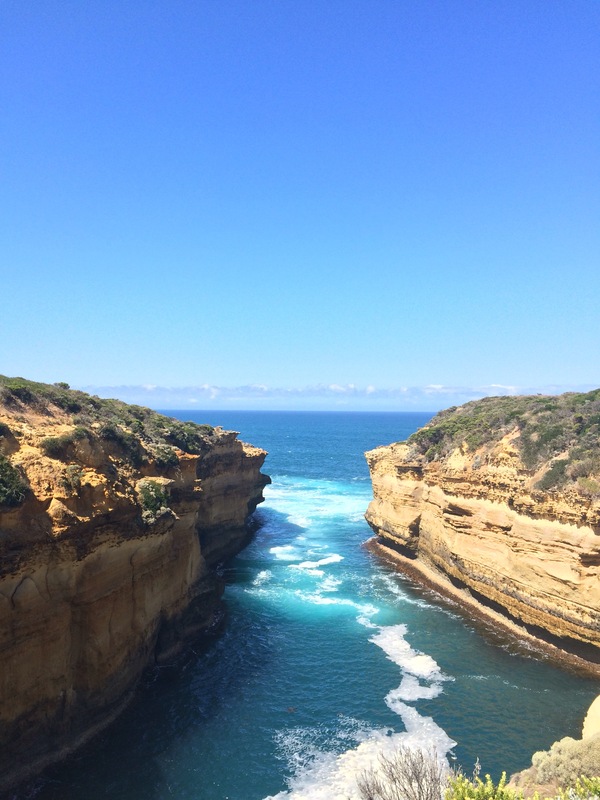 We visited all of the major sights along the Great Ocean Road including Gibson’s Steps, the Twelve Apostles (in the daylight), Loch Ard Gorge, London Bridge and the Bay of Martyrs. My favourites were Gibson’s Steps and the Apostles but they are all magnificent. The colours are particularly vivid, the sea is eternally sapphire blue in its depths and bright teal as it come to the shores. It looks amazing, if a little terrifying as it buffers the golden cliffs. We have to keep reminding ourselves that it’s not the norm to see so many exceptional things all at once, although I wish it could be. 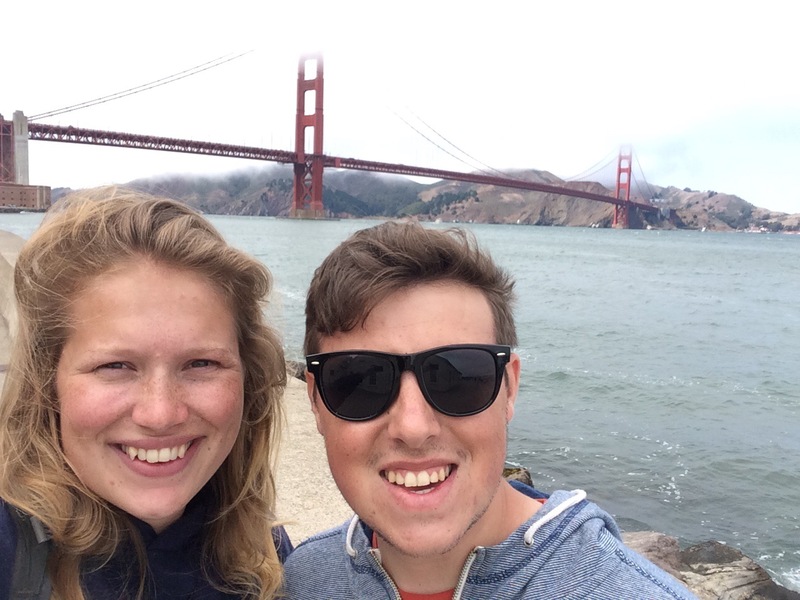 In 2014 Millie and Ryan decided to travel around the world in 365 days. 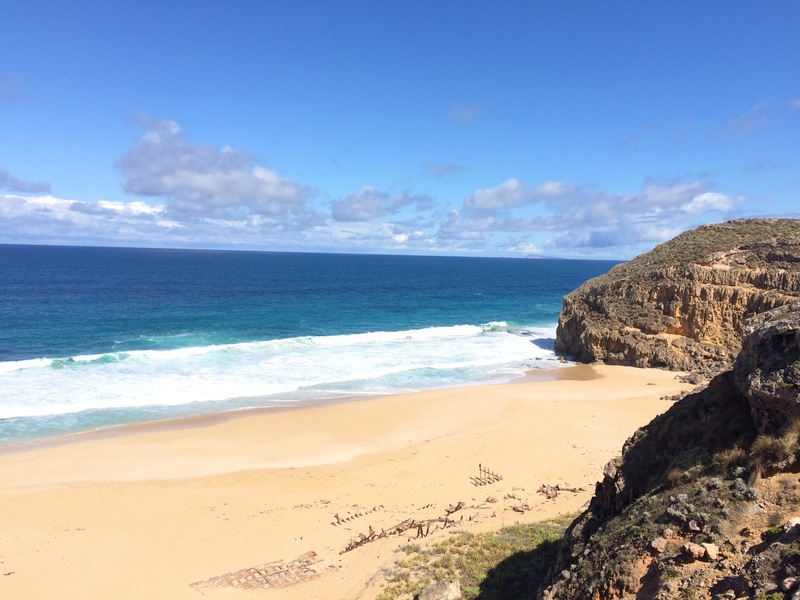 On our blog you'll be able to follow the build up to our trip and be able to keep in touch and up-to-date with our journey across the continents.